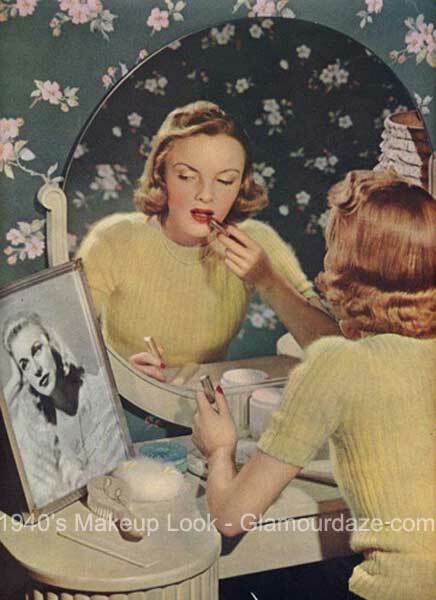 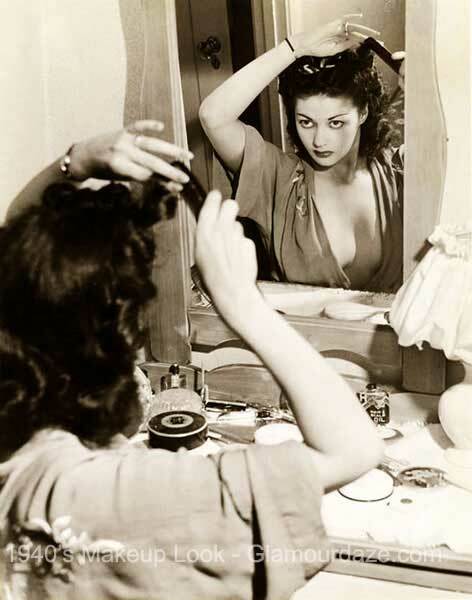 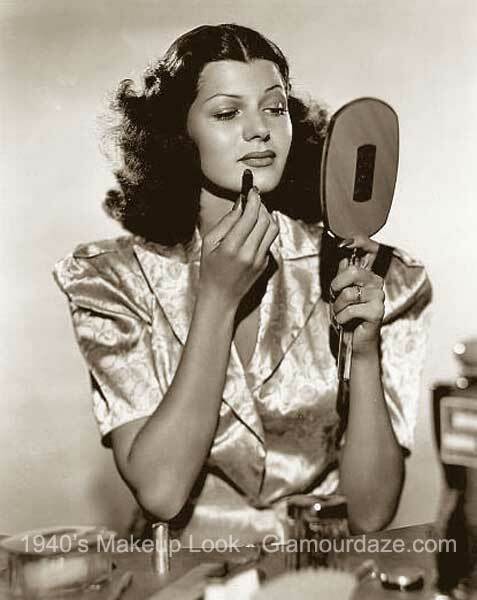 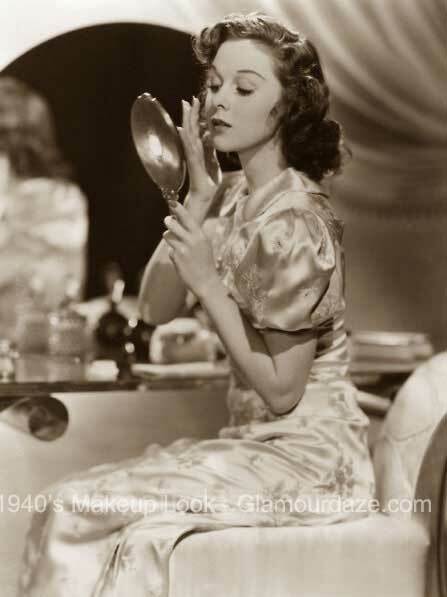 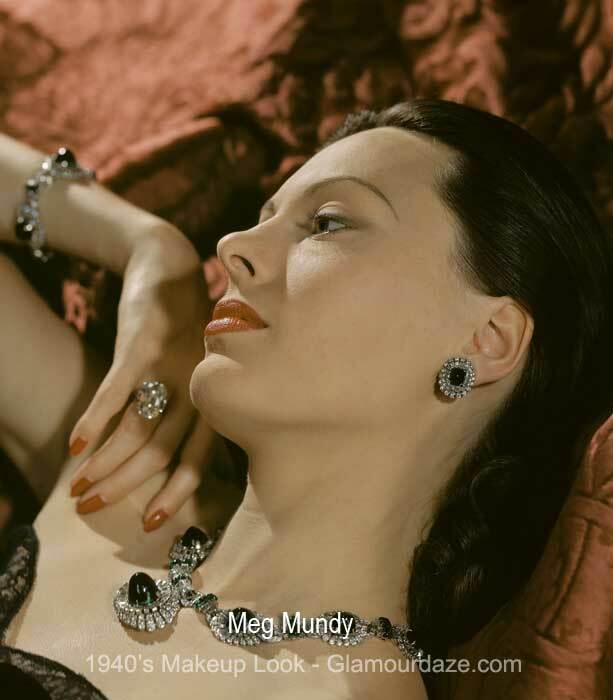 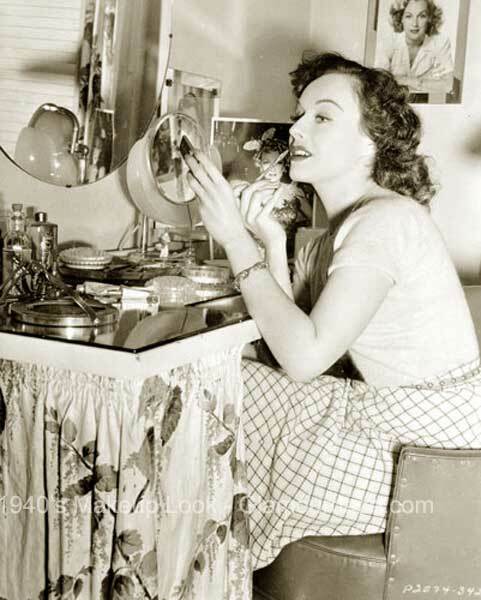 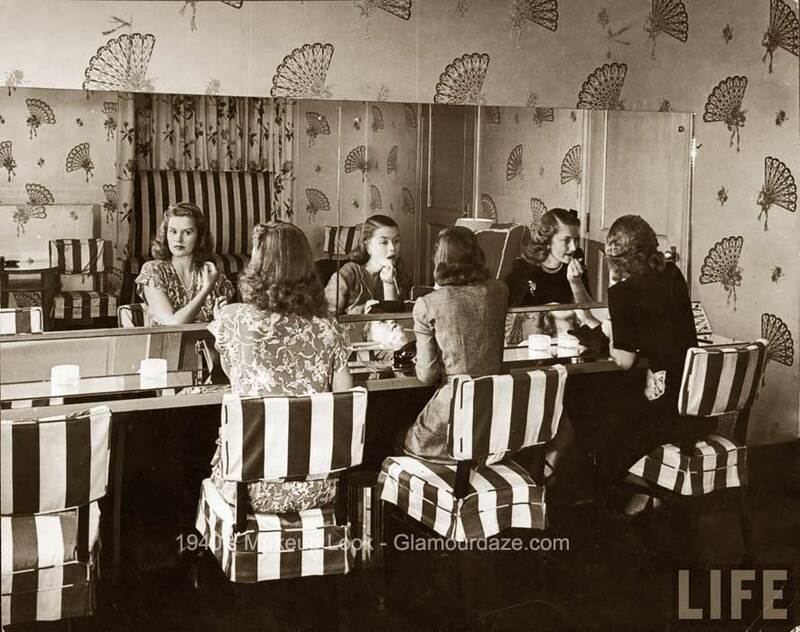 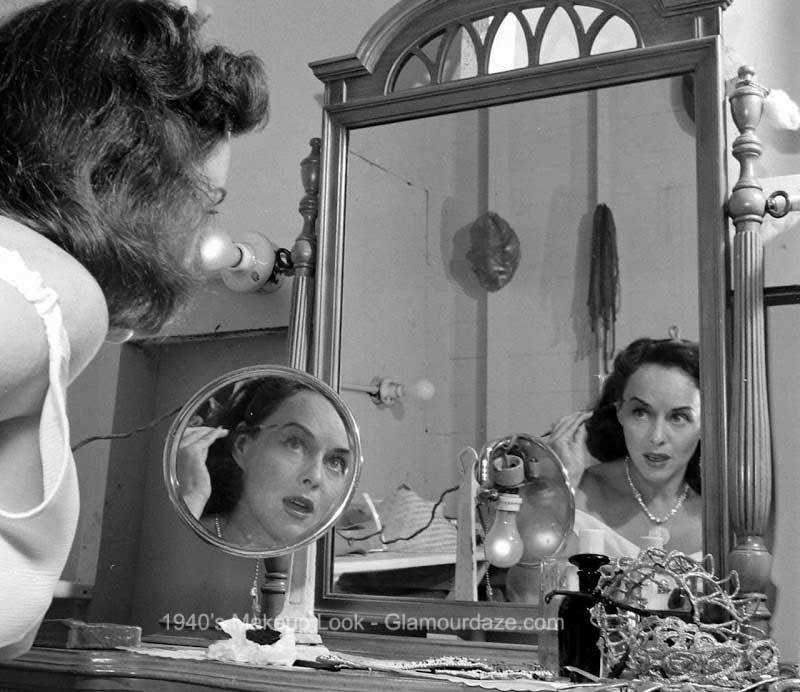 As the 1930’s came to a close, 1940’s women’s makeup was a huge industry, with brands such as Coty and Tangee notably becoming major rivals to cosmetic brand leaders like Max Factor, Helena Rubinstein, Maybelline, Elisabeth Arden and Dorothy Gray. 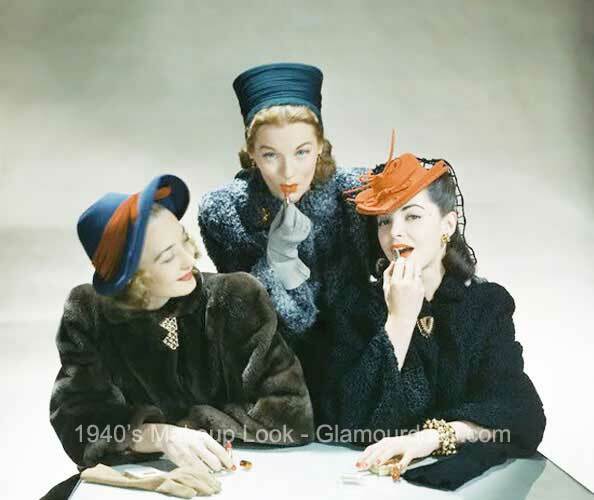 Not even another world war was going to halt the advance of fashion in the 1940s. 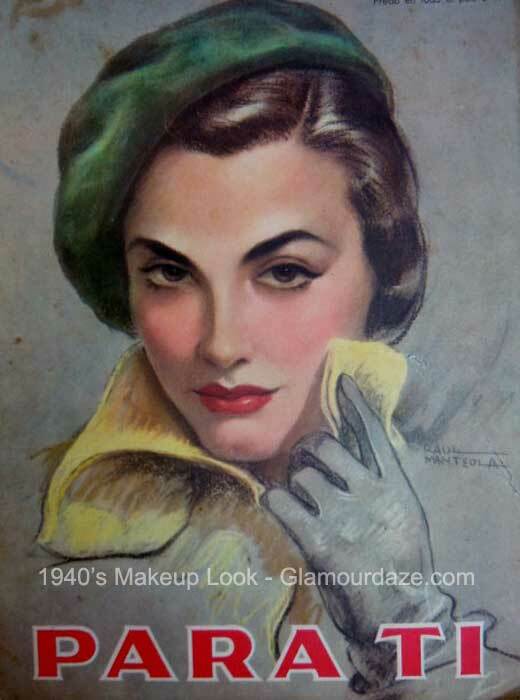 The 1940’s woman has a look all to her own. 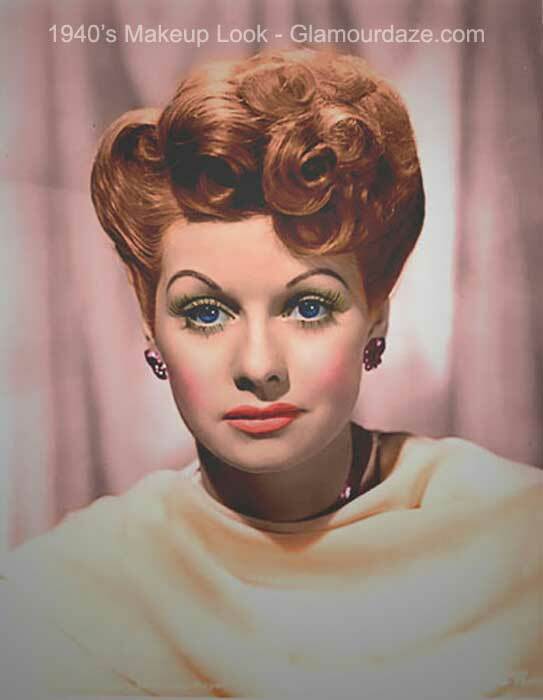 Confident up-do hairstyles, redder than red lipsticks and nails and prominent arched eyebrows. 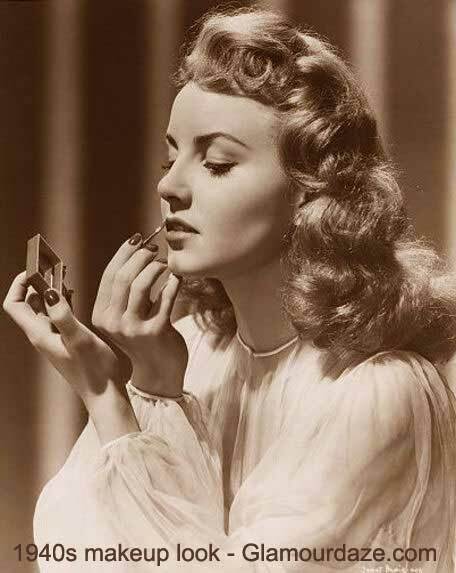 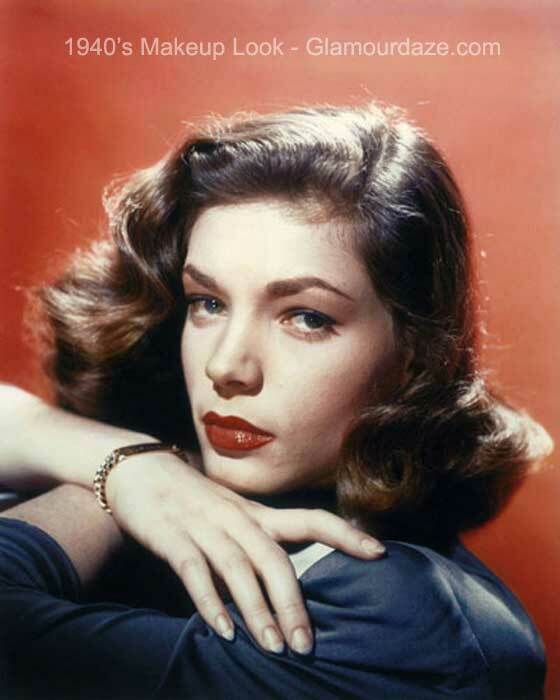 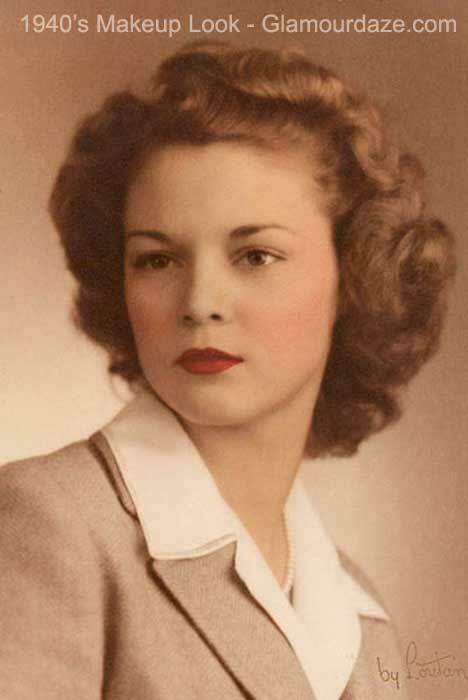 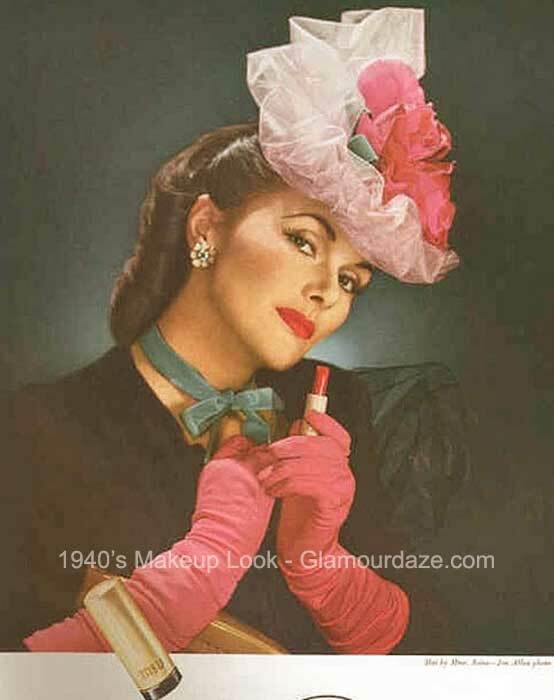 Lipsticks in the 1940s were red all the way and while there were now countless shades to choose from, the final objective of any young 1940s woman was prominent red lips. 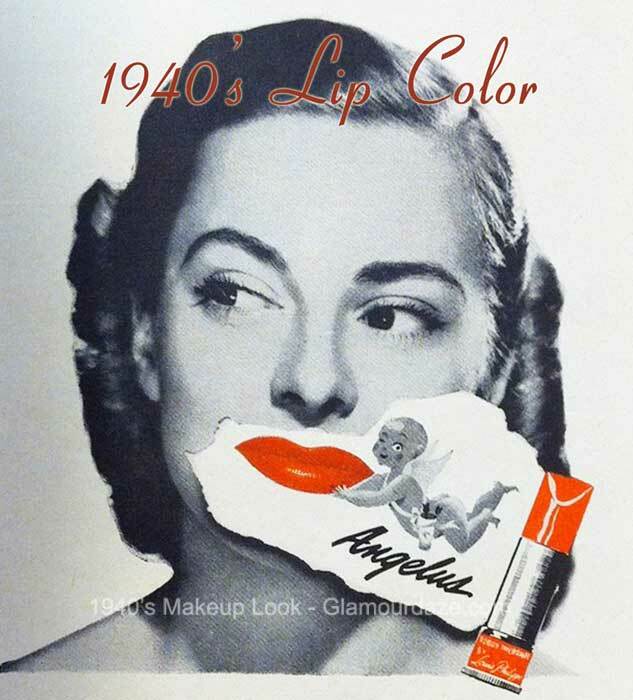 Replacing the thin understated lip contours of the 1930’s was a deep luscious full mouth. 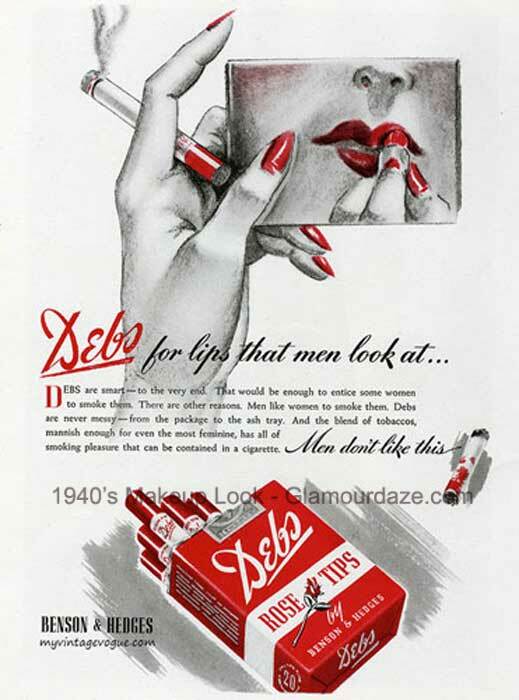 What’s not to adore about this Victory Red lipstick from Besame Cosmetics. It is such a vital color. 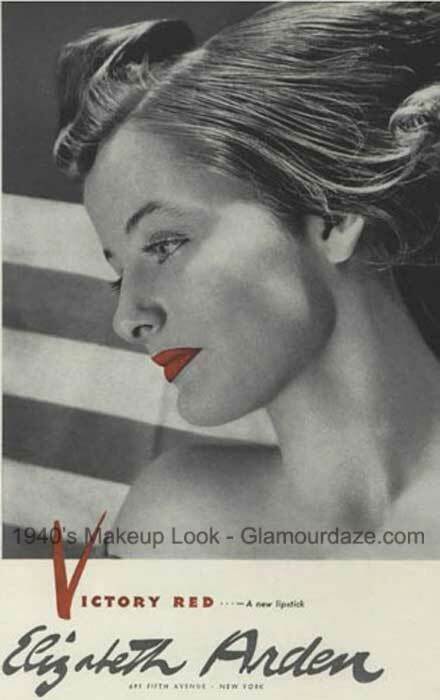 The vital red conjures up so many images of the WW2 1940#s woman. 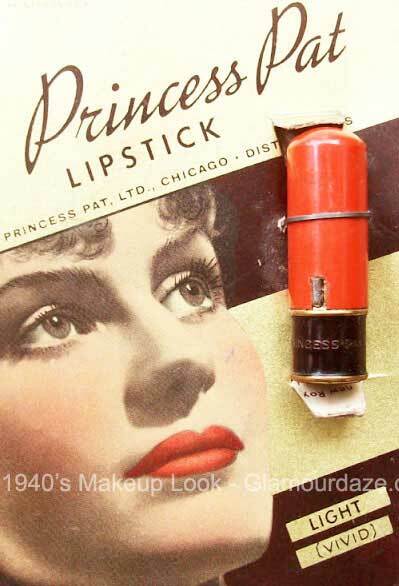 In fact we think it’s the best vintage inspired lipstick around. 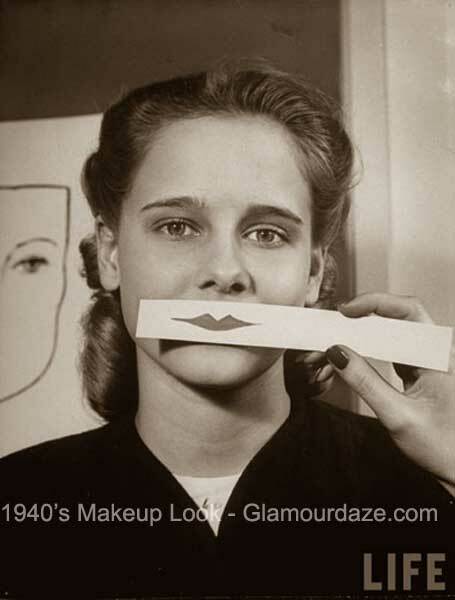 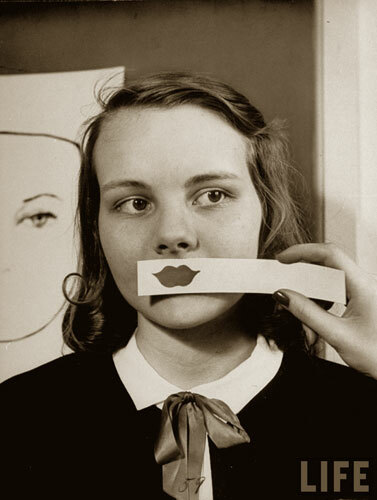 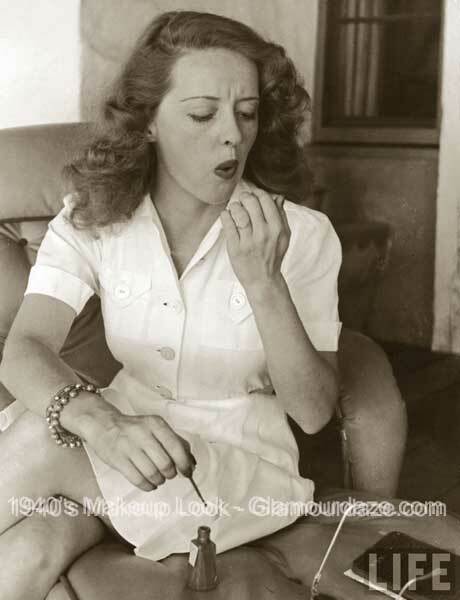 1940s beauty guides encouraged women to use a pencil to draw an outline ‘outside’ their natural lip line to enlarge her mouth. 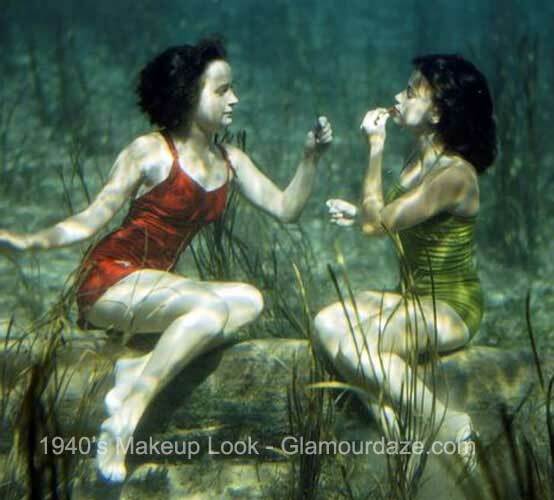 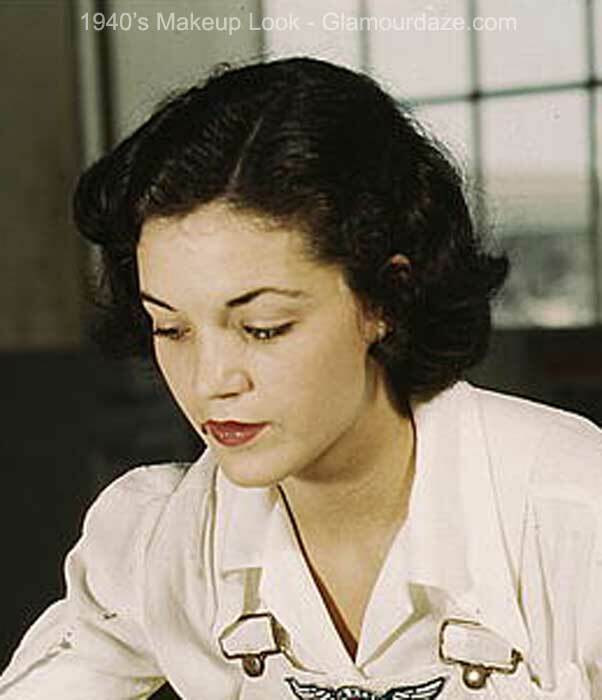 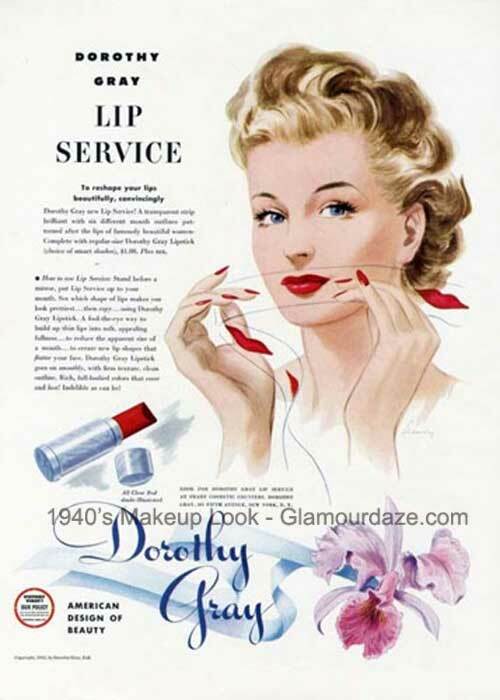 As most lipsticks were matte, Vaseline was used to add a little luster and gloss. 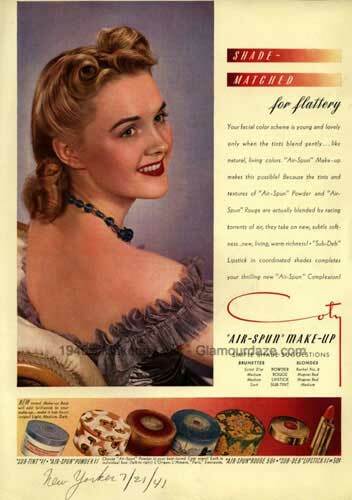 The eyebrow was now simply kept well groomed. 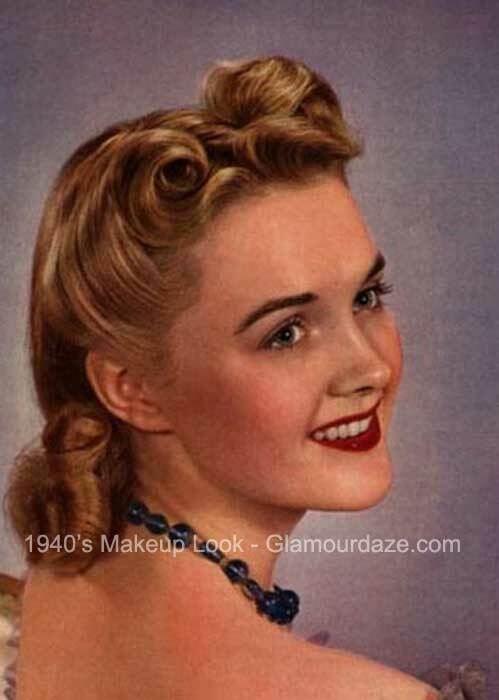 A girl lavished love on her brows and lashes and many handy homemade hints were followed to give a girl a bright sparkle. 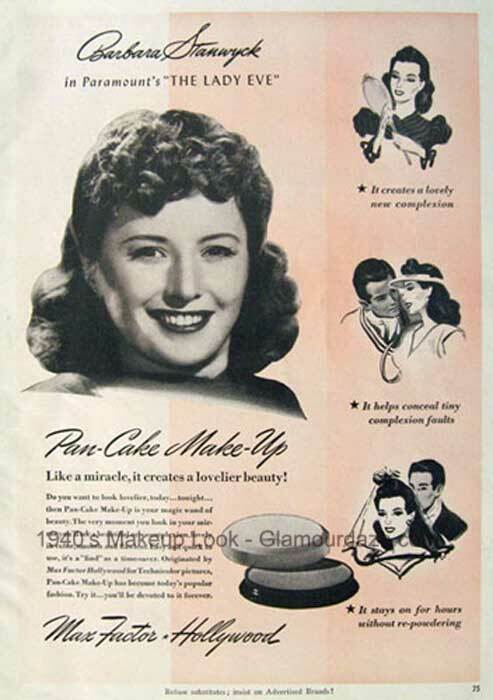 Max Factors Pancake foundation which appeared in the late 1930’s had many imitations but was hugely popular during the war because of its handiness. 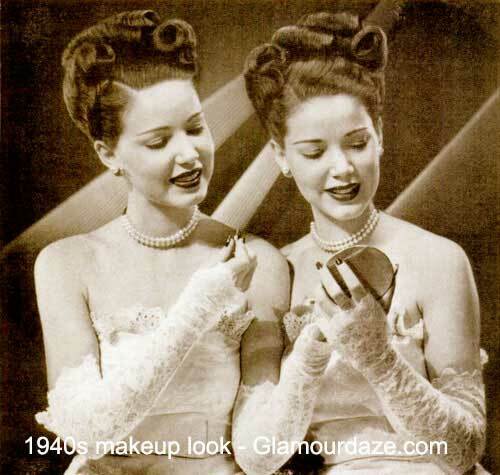 Powder Compacts had replaced the messy loose powders of the 1920’s and 1930’s. 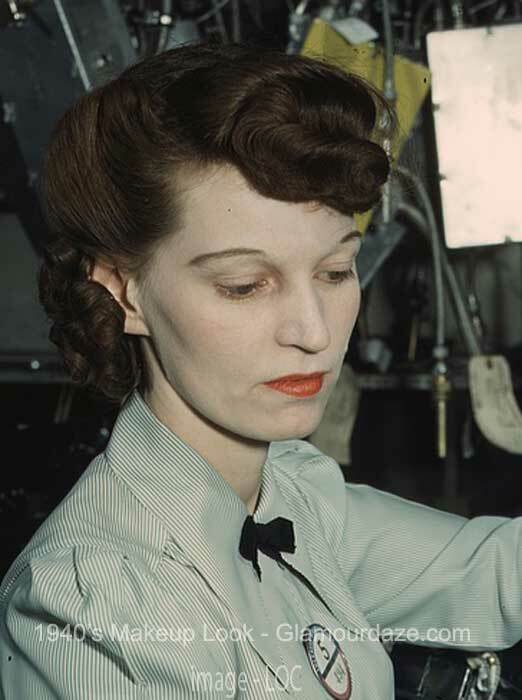 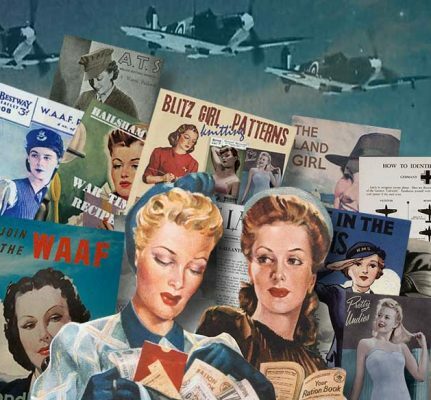 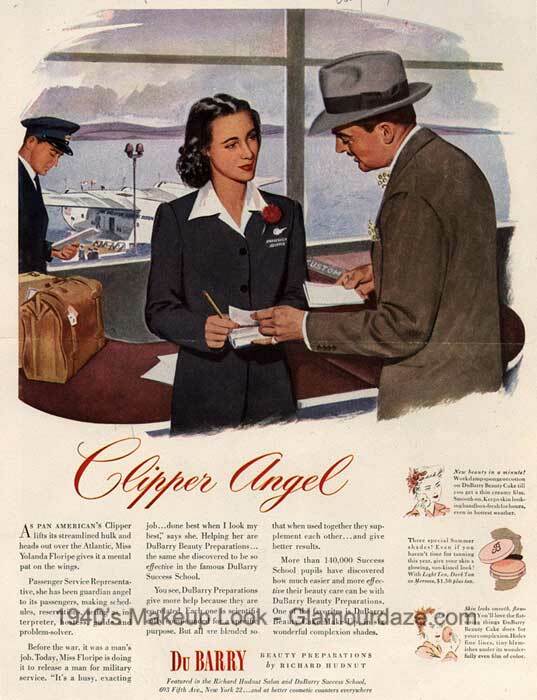 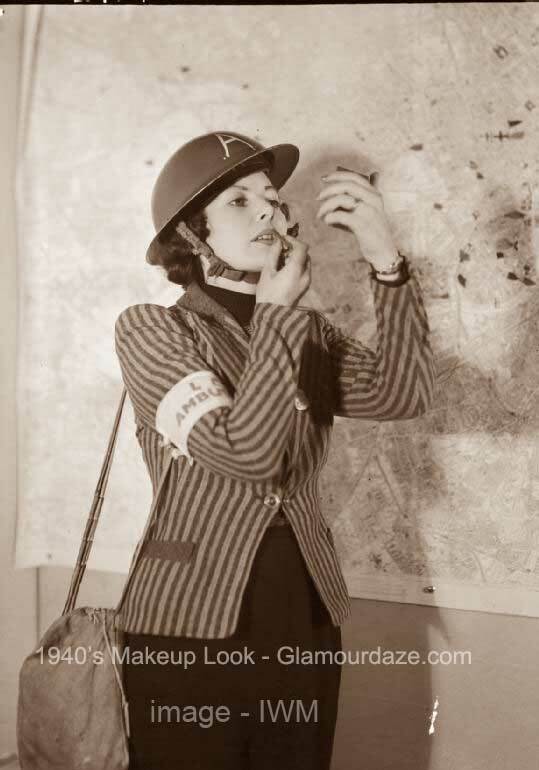 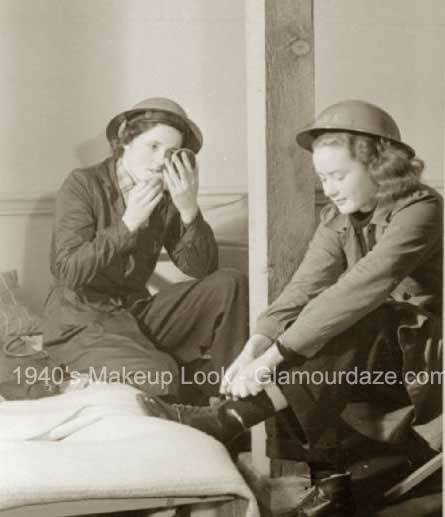 Makeup had to be ‘on the go’ for women, many of whom found themselves working in very ‘unfeminine’ conditions in munitions and aircraft factories on both sides of the Atlantic. 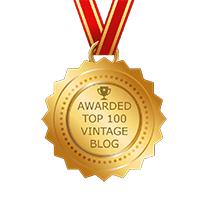 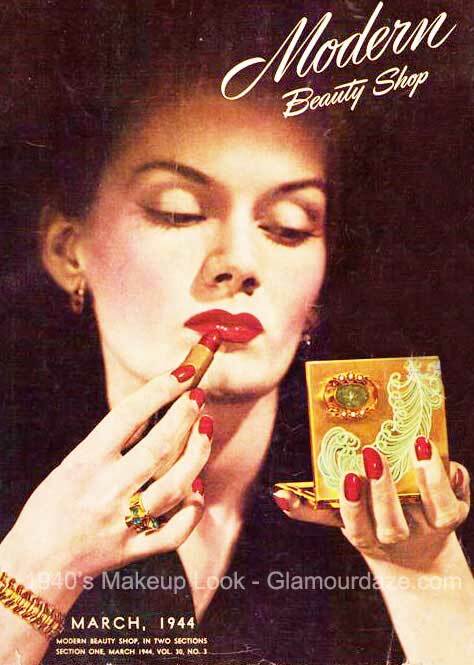 These gorgeous vintage compacts are much sought after now by collectors. 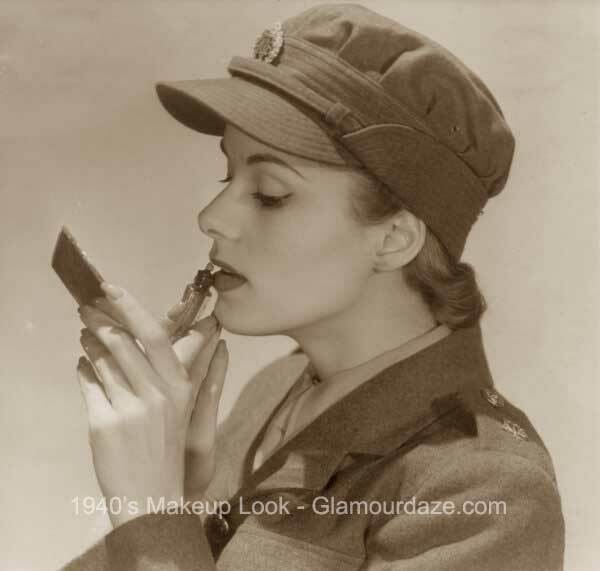 1940’s Rouges were often in short supply in Britain and Europe, so many women simply used their lipstick to rouge and contour their faces. 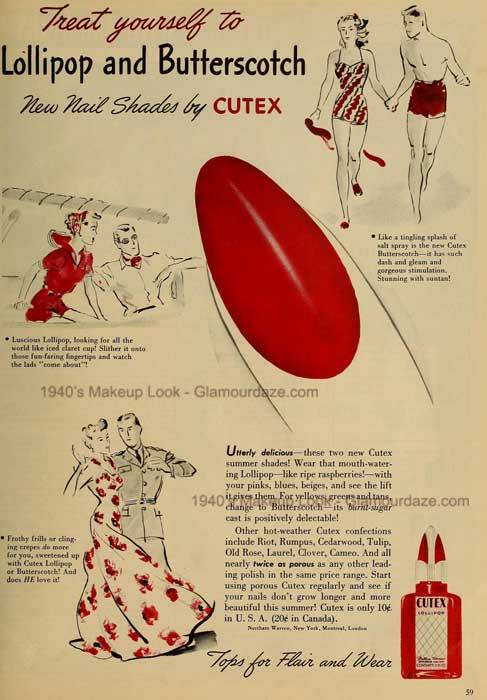 Nail coloring still followed the half moon look of the previous decades but now just the tip of the nail was left unpainted – generally for practical reasons. 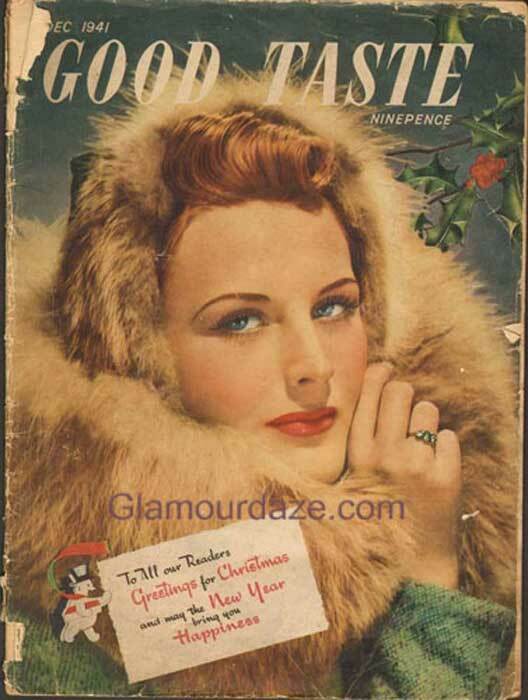 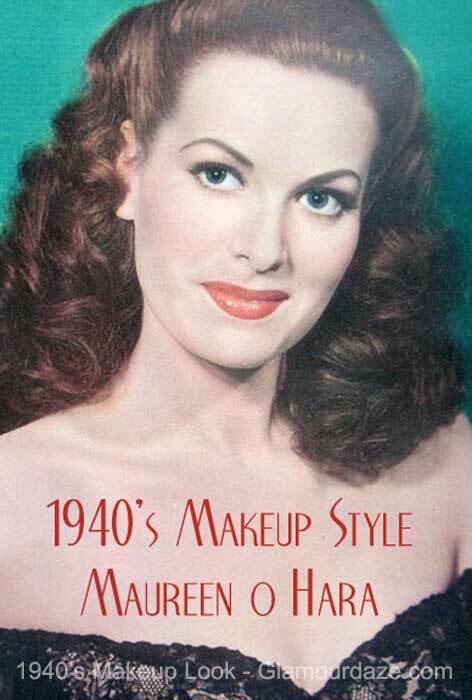 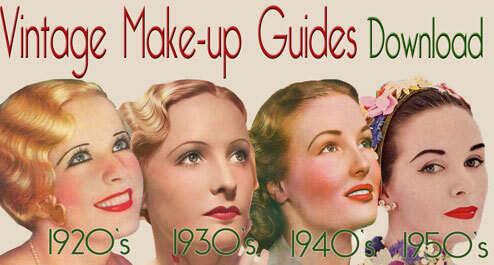 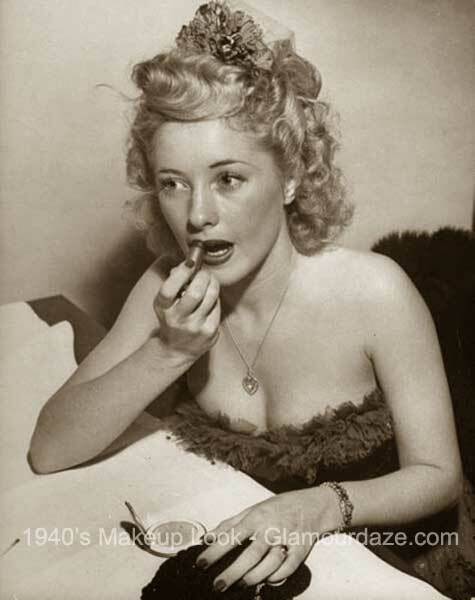 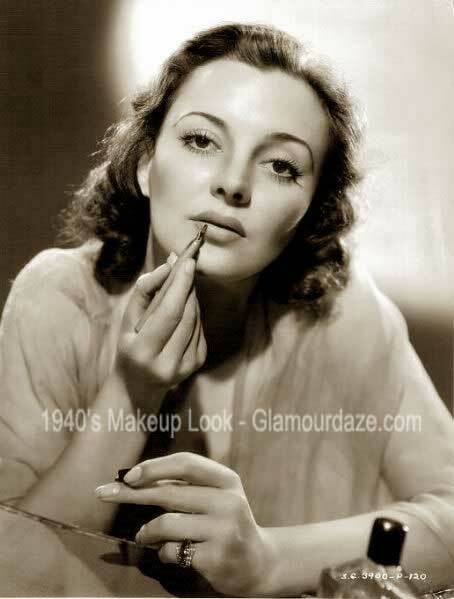 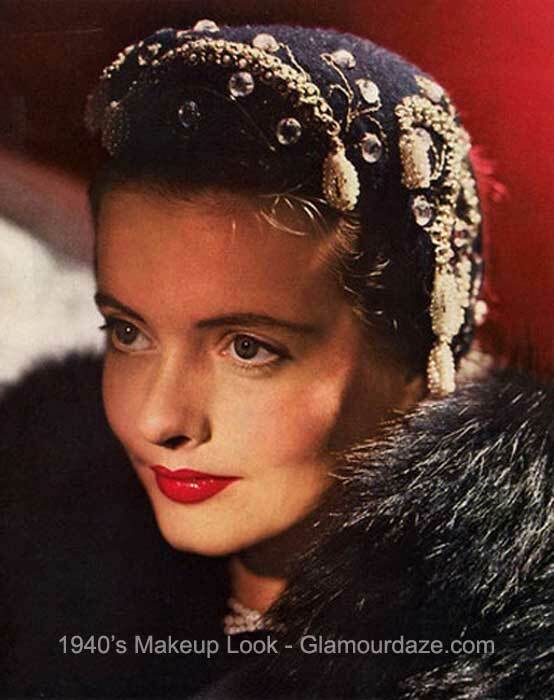 Read original 1940’s makeup guides. 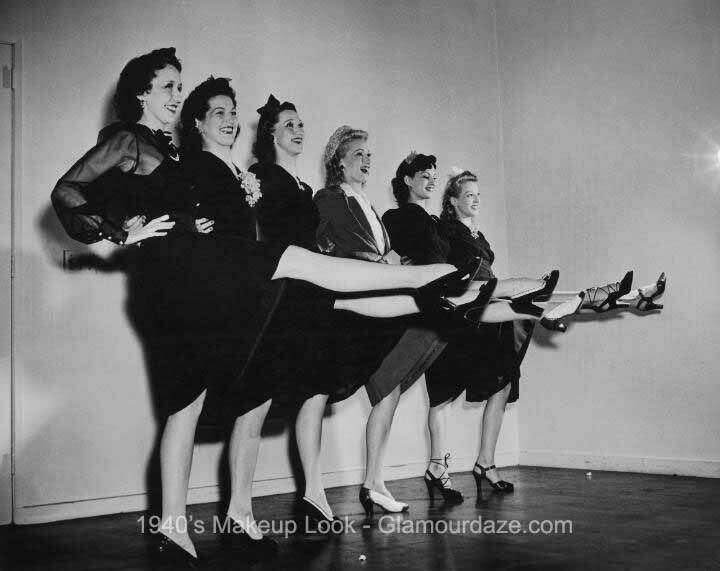 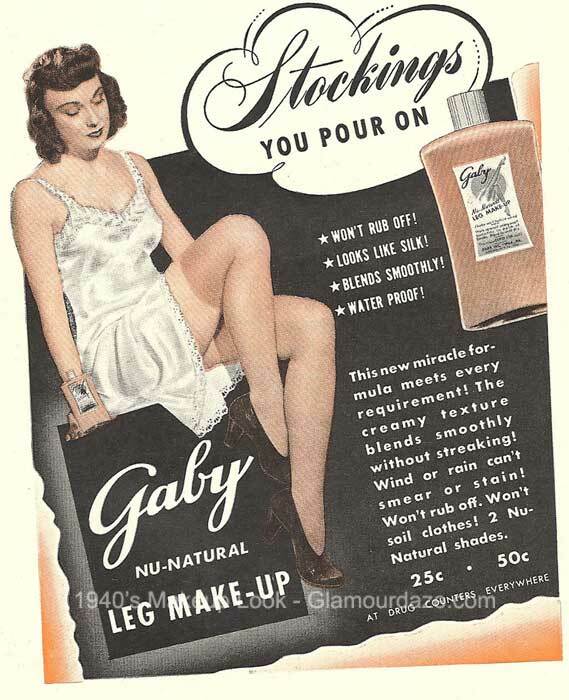 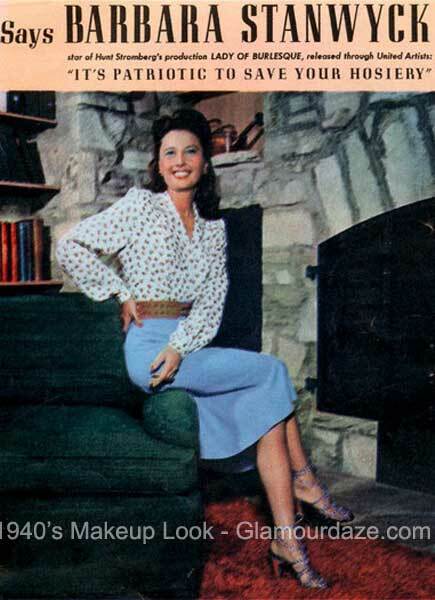 Another phenomenon of the 1940’s war were liquid or cosmetic stockings, seams and all – which came about from the shortage of silk and the new nylon.In the US there was quite a choice of cosmetic stockings to play with, all boasting ‘long life’ and ‘water proof’. 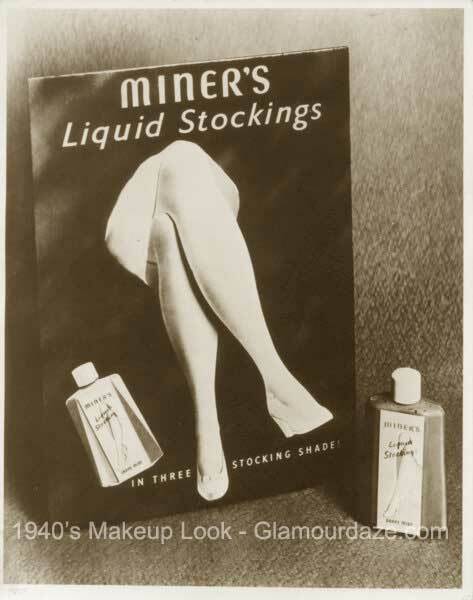 In the UK women had Miner’s Makeup Liquid Stockings, if you could afford it, for many it wasn’t so glamorous. 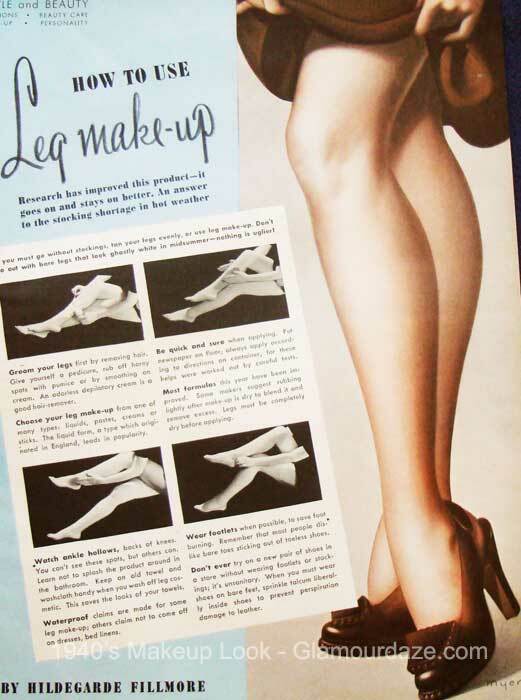 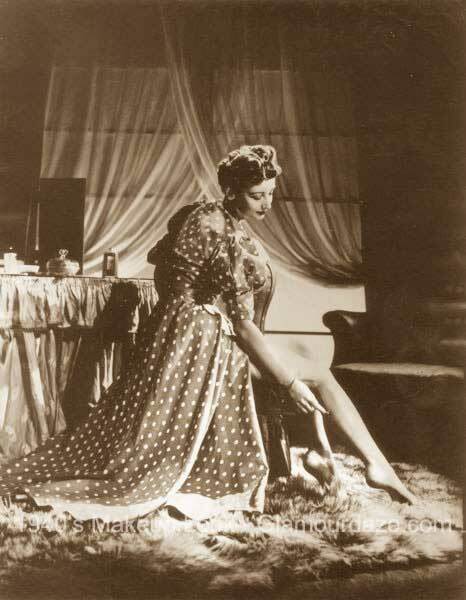 Only the lucky and wealthier few had access to either nylons or their cosmetic equivalent. 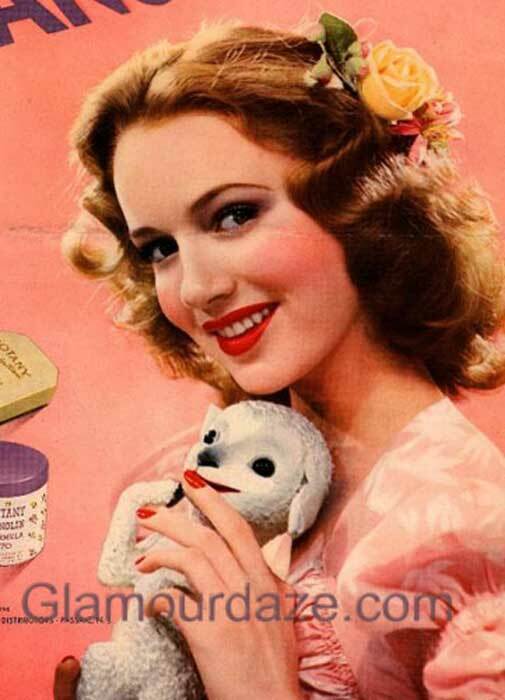 Many working class girls used products from the kitchen like Bovril and Tea. 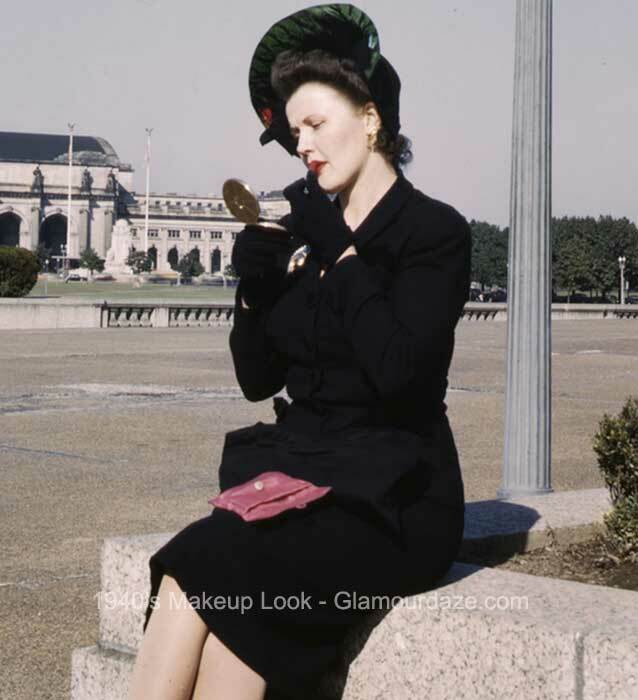 While there is a popular ‘retro pinup’ look much stylized by the likes of Dita Von Teese – it is not an accurate depiction of the 1940s look. 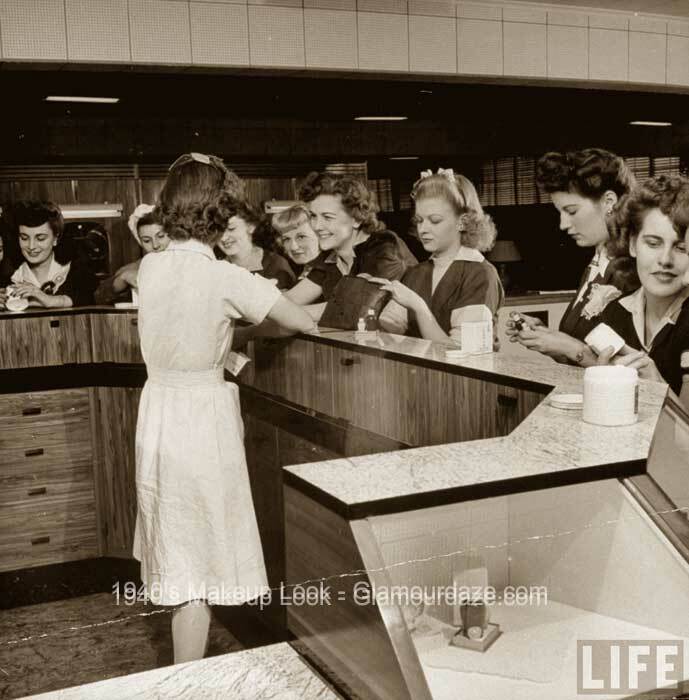 Simplicity and convenience was the key as many women took to working in factories and on the farms. 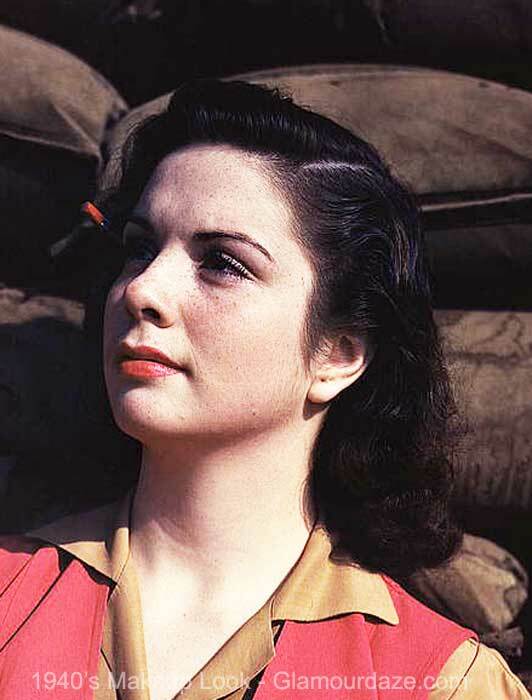 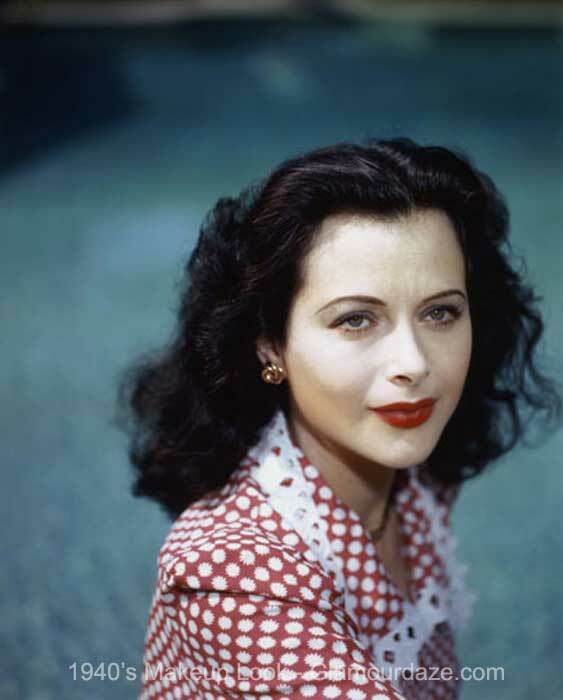 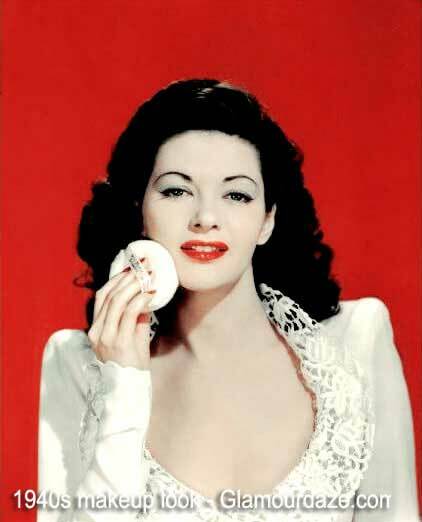 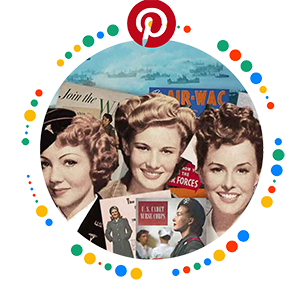 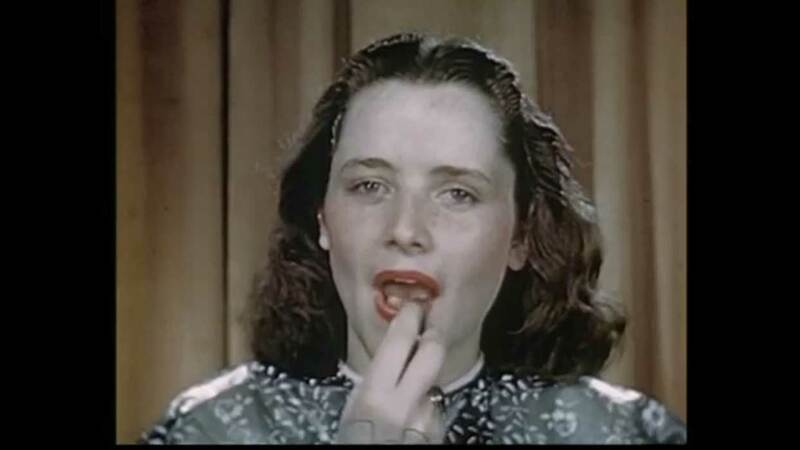 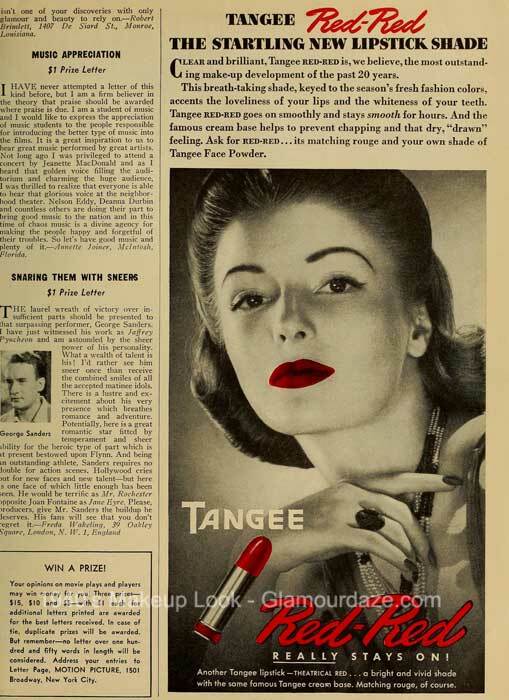 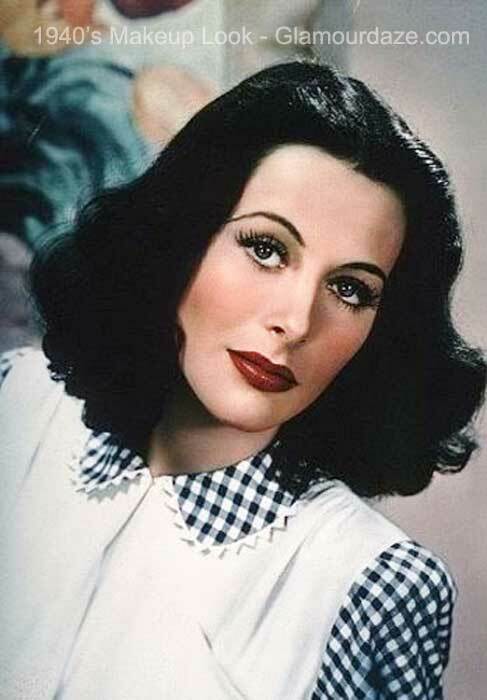 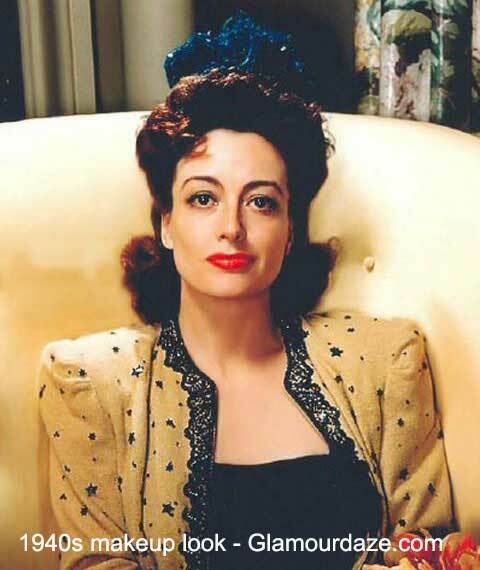 Redder than red lips made up for many a tired girl and in fact lipsticks were considered in the USA as essential for ‘the war effort’ – to keep morale up. 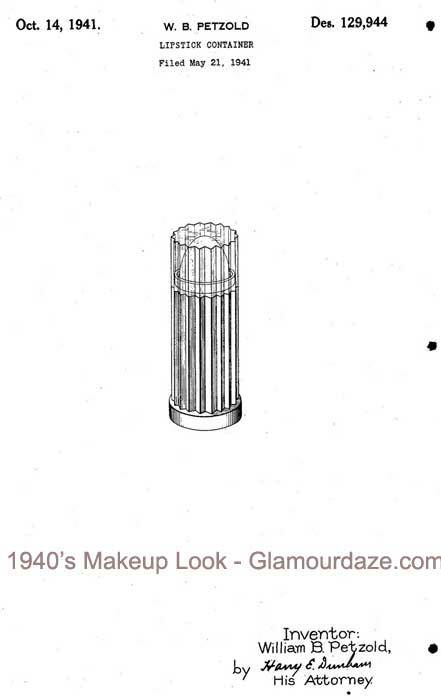 Foundation – a shade darker than your natural. 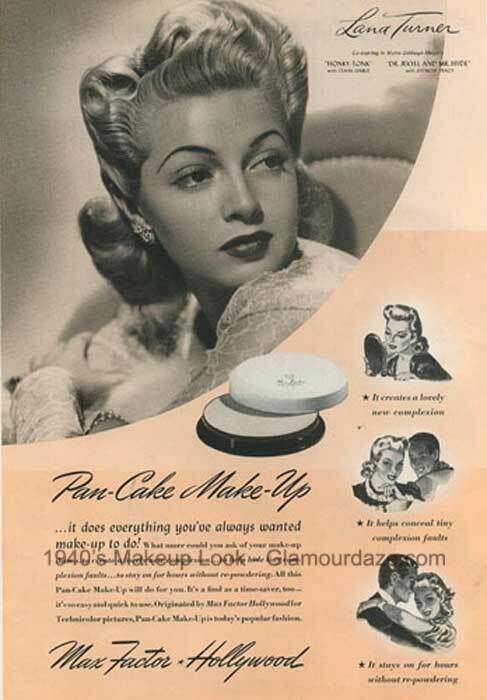 Powder – plenty of powder still, a lighter shade and patted on. 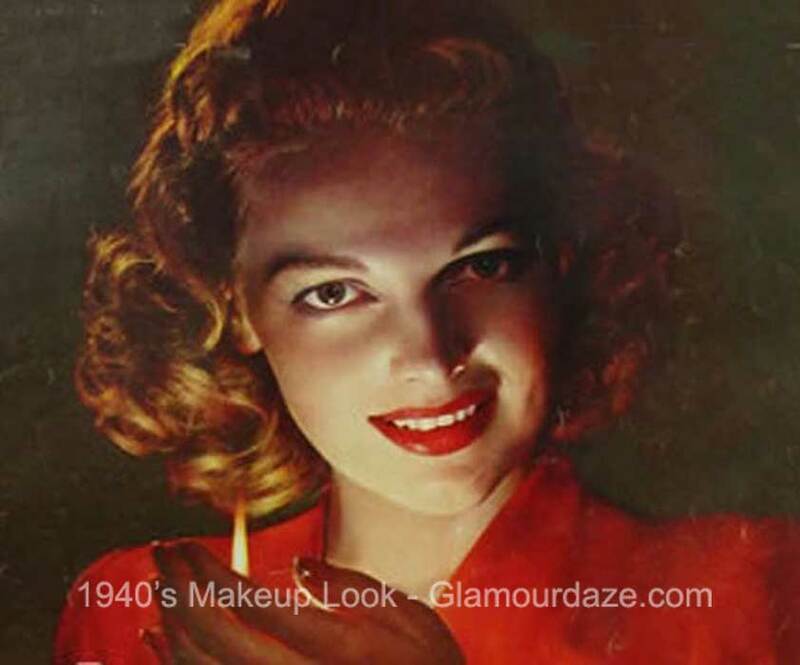 Eyes -light medium browns with beige highlighting. 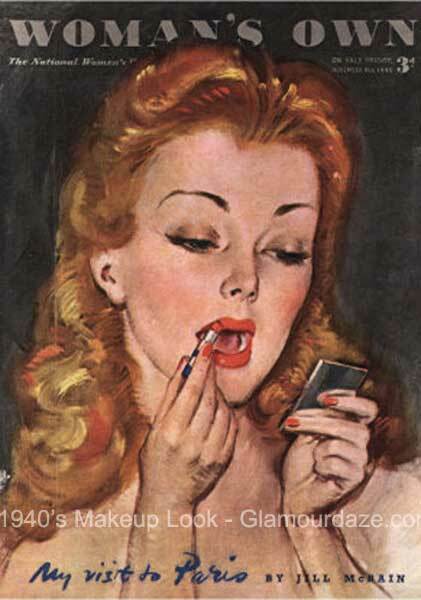 Understated. 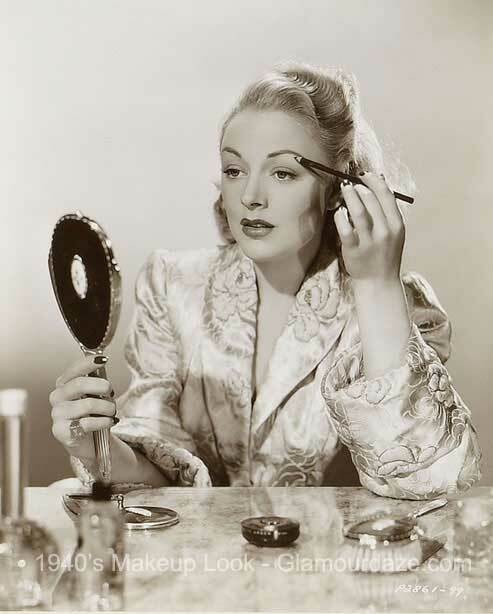 Eyebrows – much thicker than in the 1930’s. 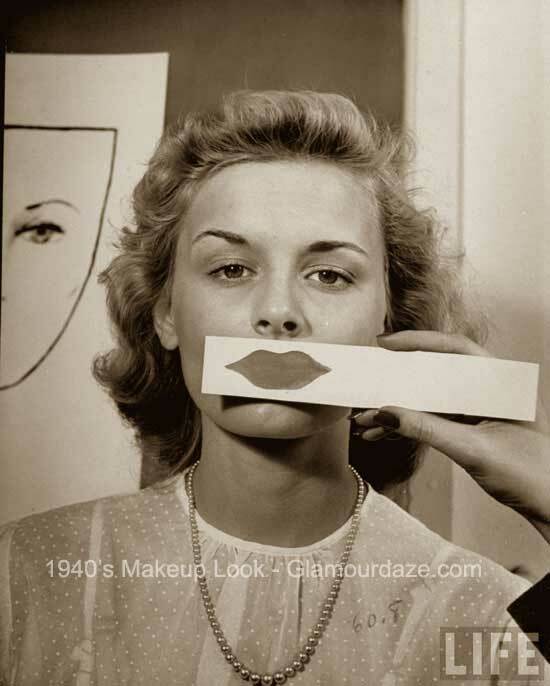 Vaseline used to groom to shape. 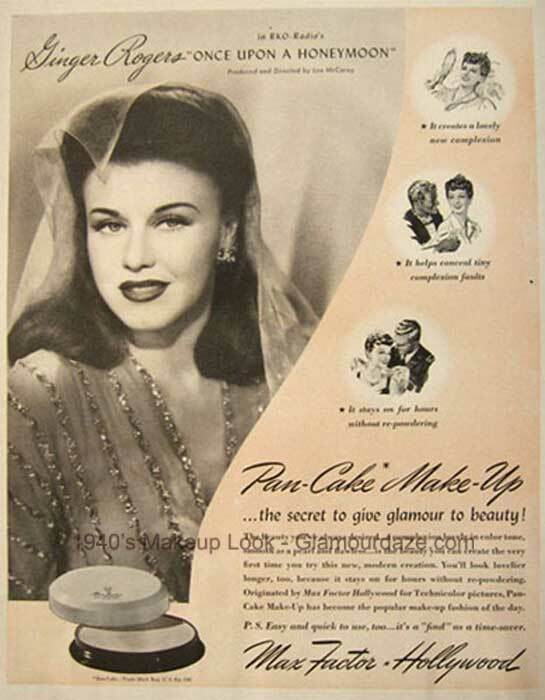 Lashes – cake mascaras like Maybelline – still applied with a brush. 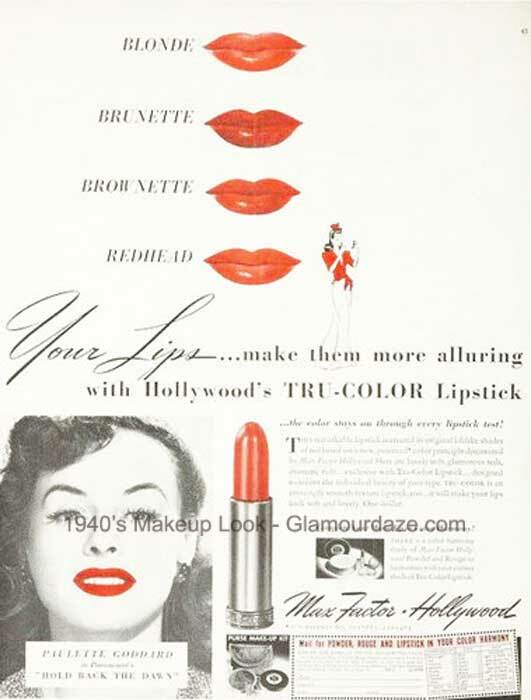 Rouge – rose colors applied out from the cheek apples. 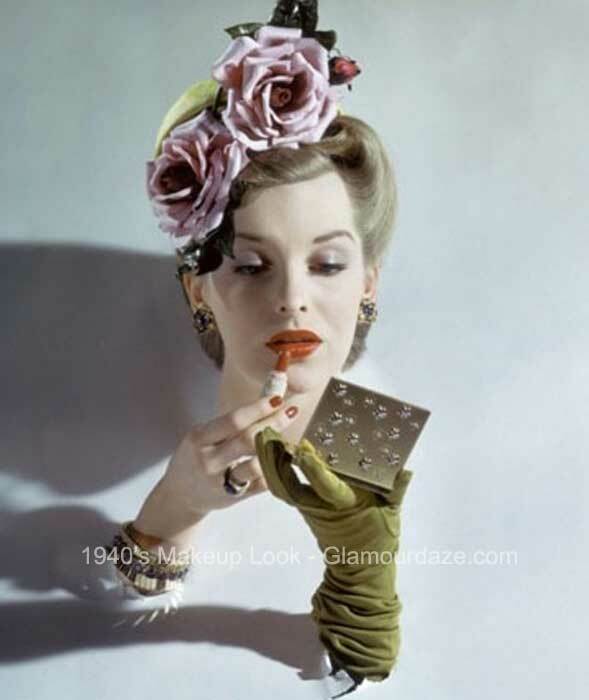 Nails – Filed to a point with the tips left unpainted. 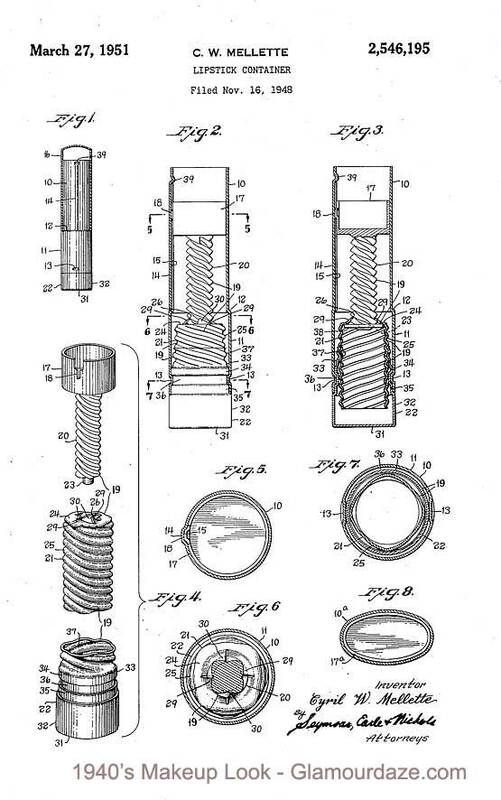 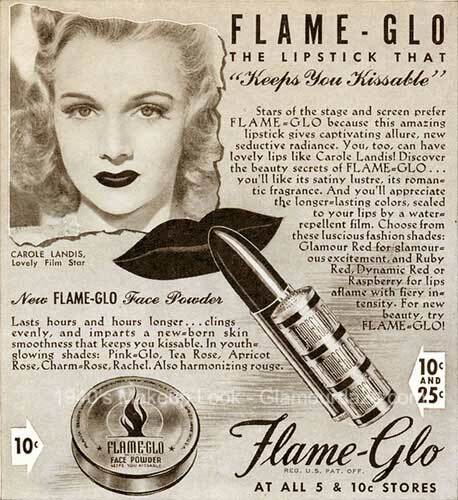 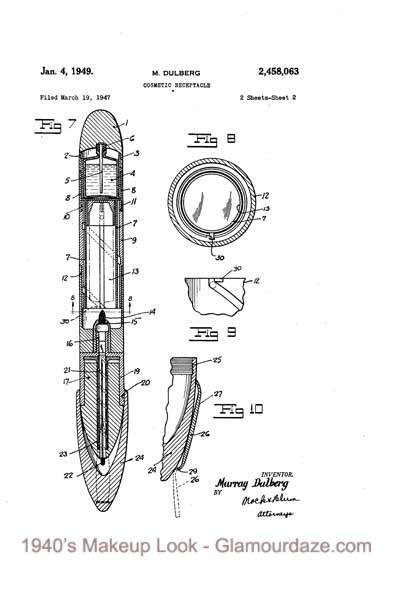 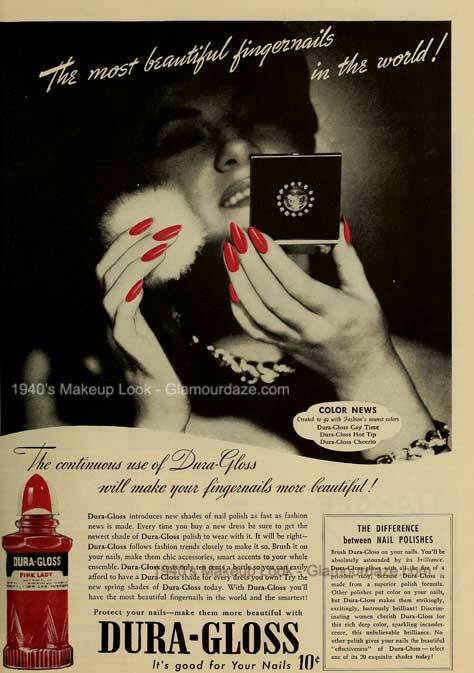 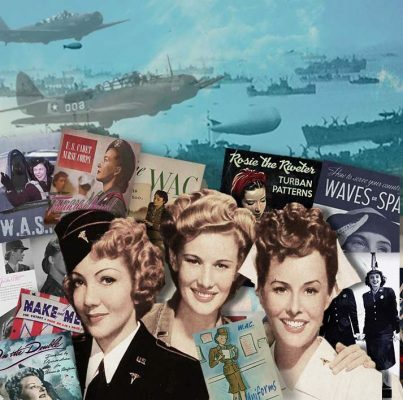 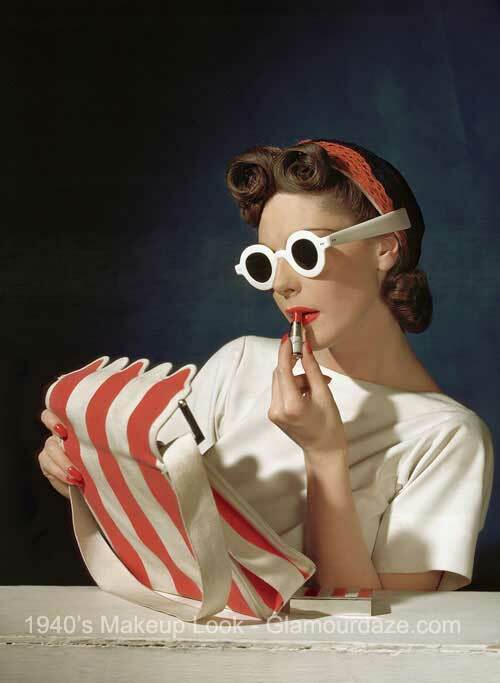 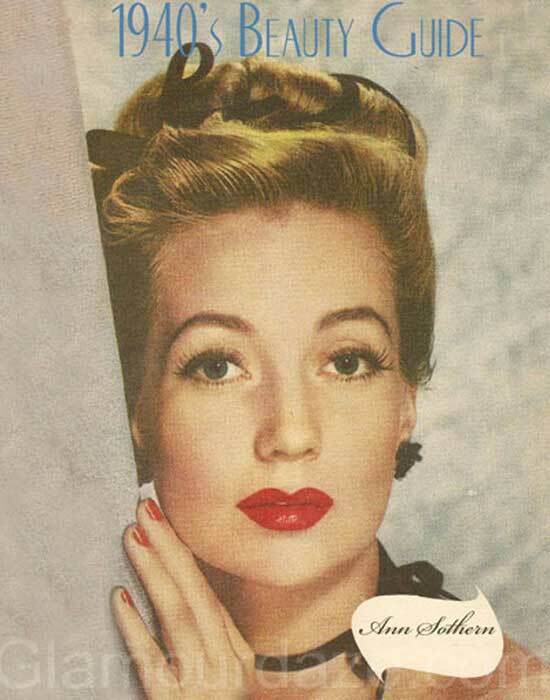 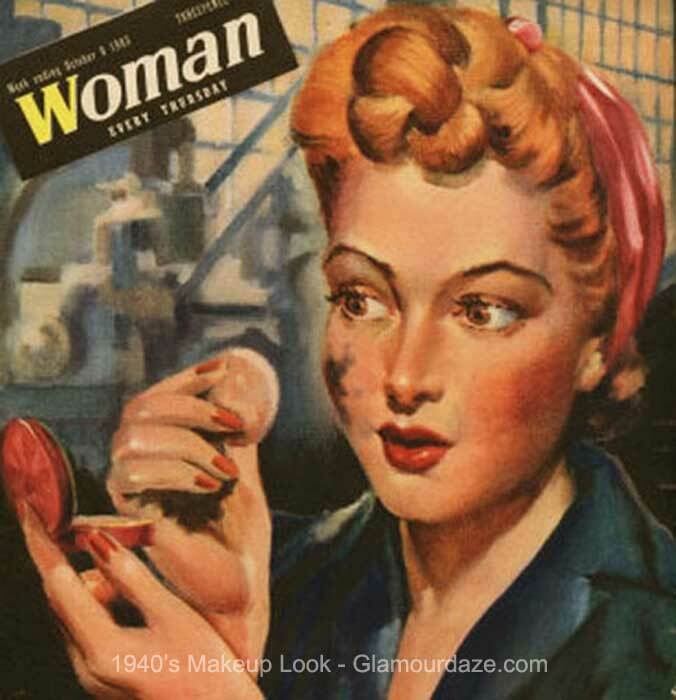 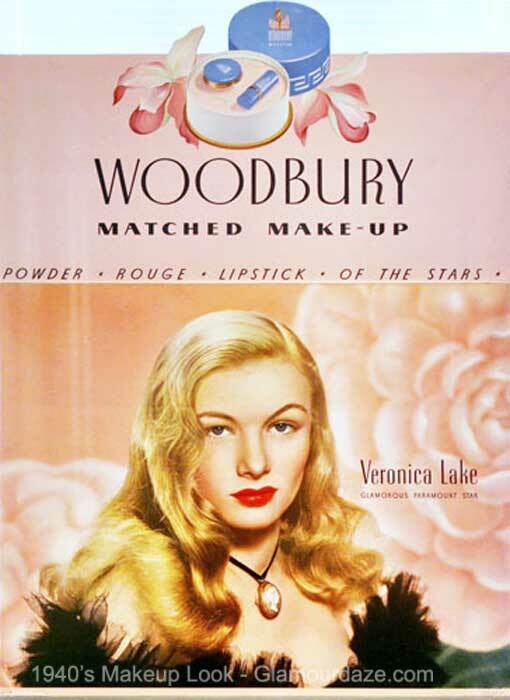 In a 1942 beauty article in Click magazine, women were reassured that ” if Uncle Sam needed your lipstick or shaving mug for bombs or bullets, he’d have gotten it first” It was considered by the US War Production Board ( WPB) that the materials used for cosmetics and their packaging was considered non essential to the war effort and conformed to their limitation guidelines. 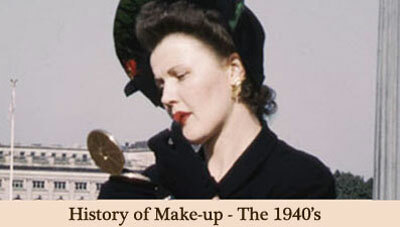 Not only that but declaring “makeup to be necessary and vital” to the US war effort. 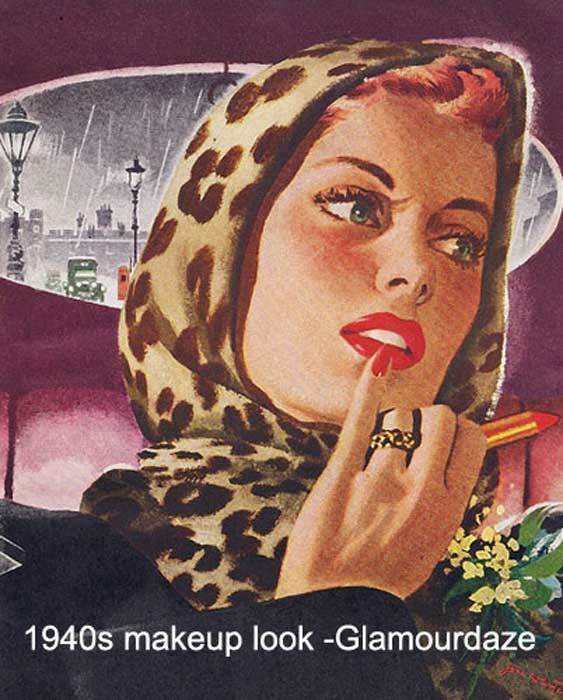 So happy days for American glamour. 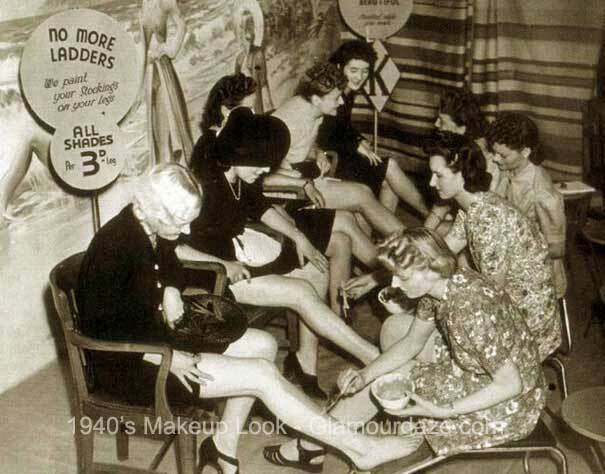 However women were encouraged to ‘bulk buy’ in case of shortages. 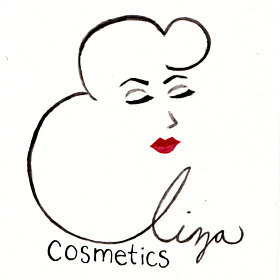 Developing new makeup products though were forbidden under the WPB limitations. 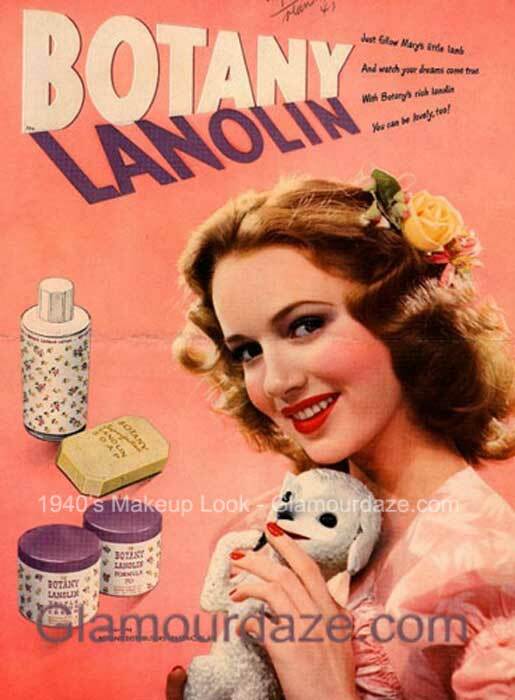 In Britain the Board of Trades rationing was much more severe – even basic soaps were scarce and therefore considered ‘essential’ for hospitals etc. 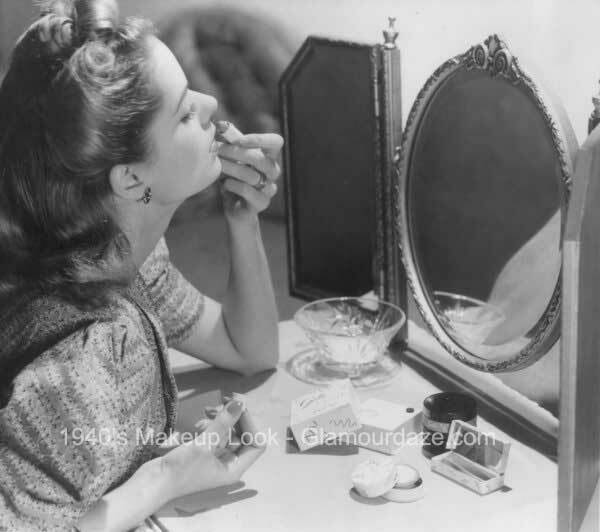 Makeup was not rationed in the UK but was extremely scarce -so women had to make do sometimes with homemade efforts. One exception to the ‘new cosmetics ban’ was in the USA. 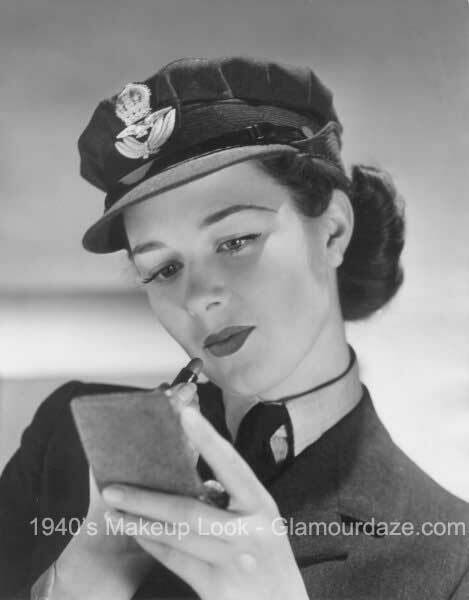 Elizabeth Arden was asked to create a makeup kit for the Marine Corps Women’s Reserve. 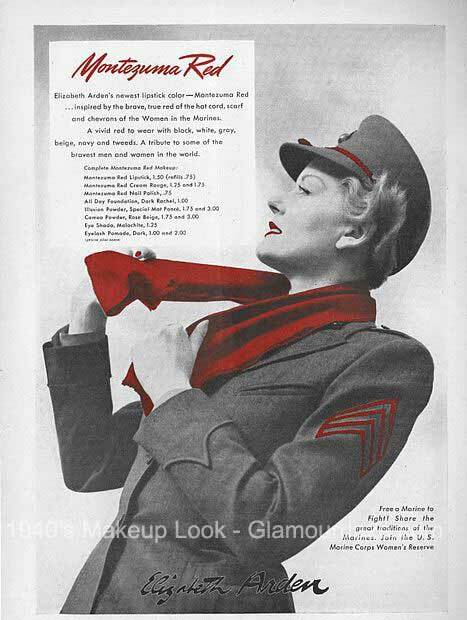 She brought out a rang of lipsticks like Victory Red and Montezuma Red lipsticks which matched the red shade of the scarf, arm insignia and hat cords on their uniforms. 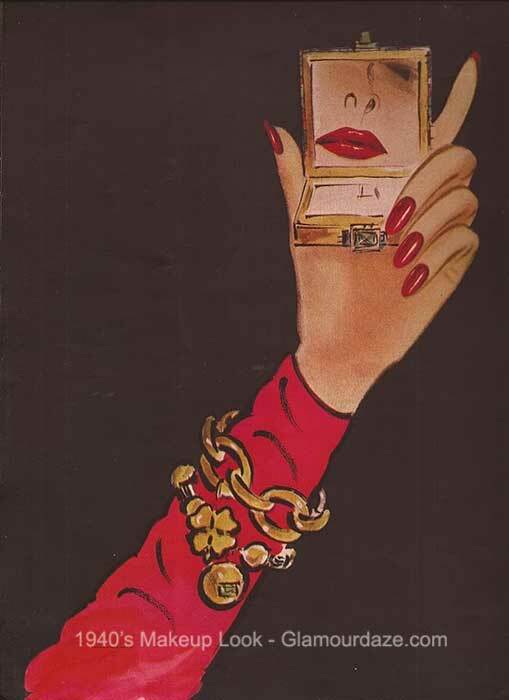 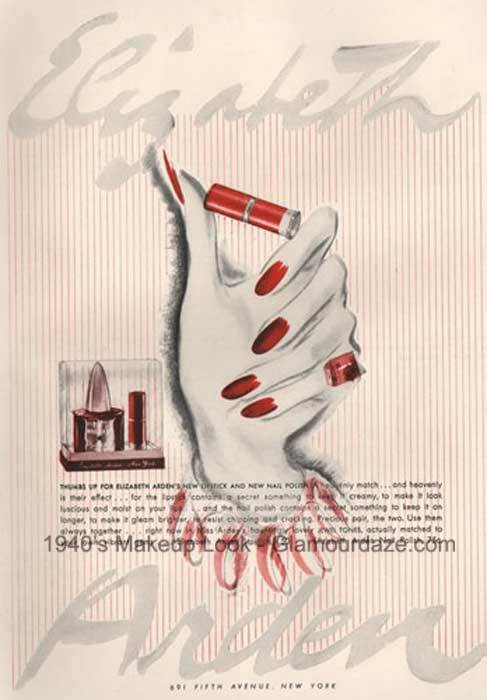 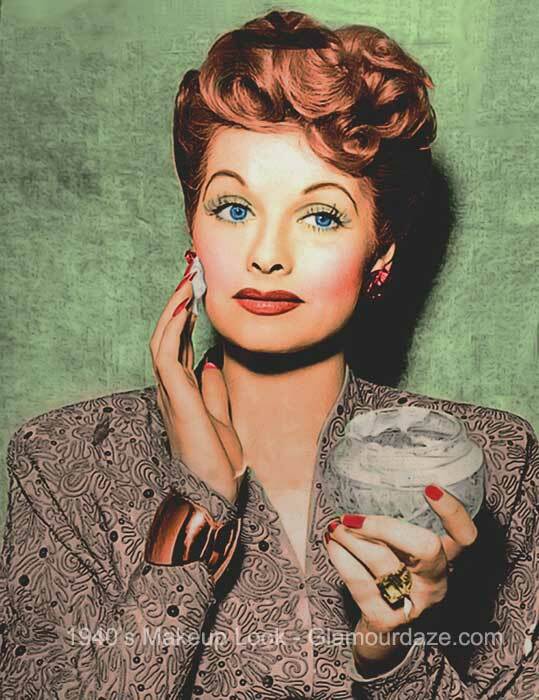 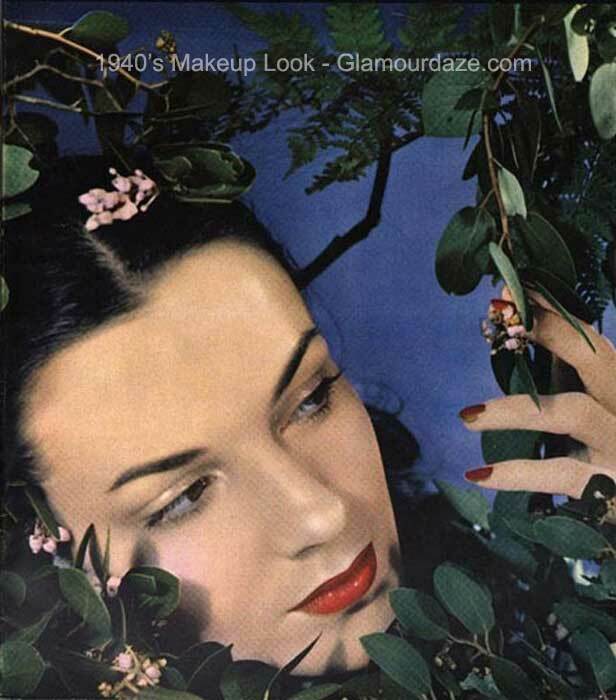 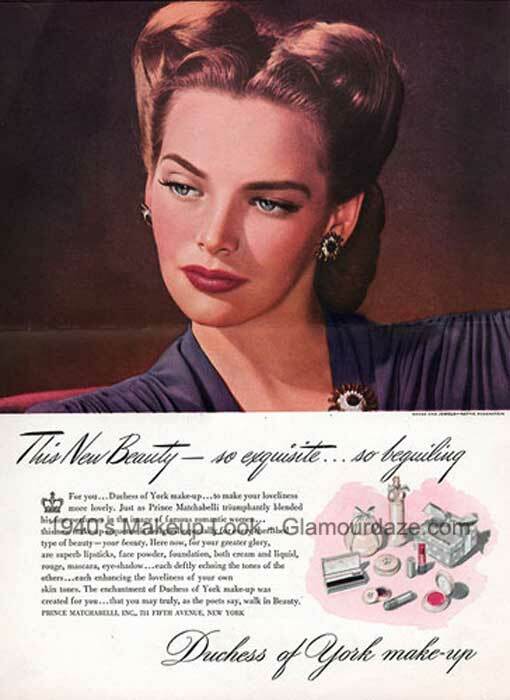 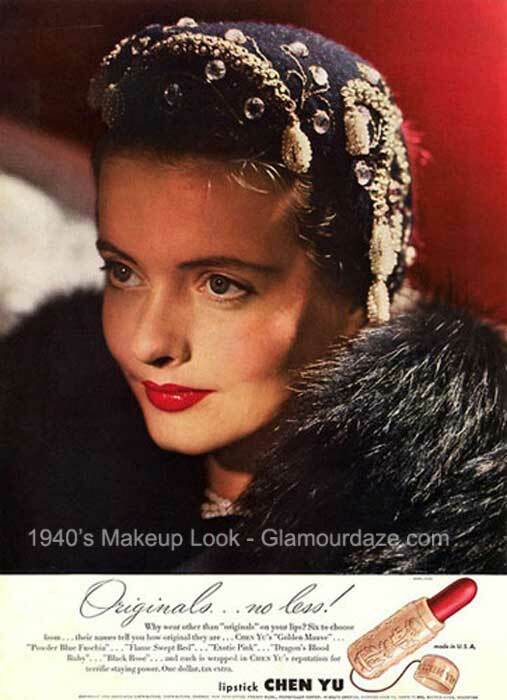 Notable new cosmetic brands to appear in the 1940s included Aziza Eye Cosmetics Co (1940), Estée Lauder (1946), Gala of London incorporates (1946), Guillaume d’Ornano establishes Orlane (1946), Eylure Cosmetics (1947), Hazel Bishop (1948), Jacqueline Cochran incorporates. 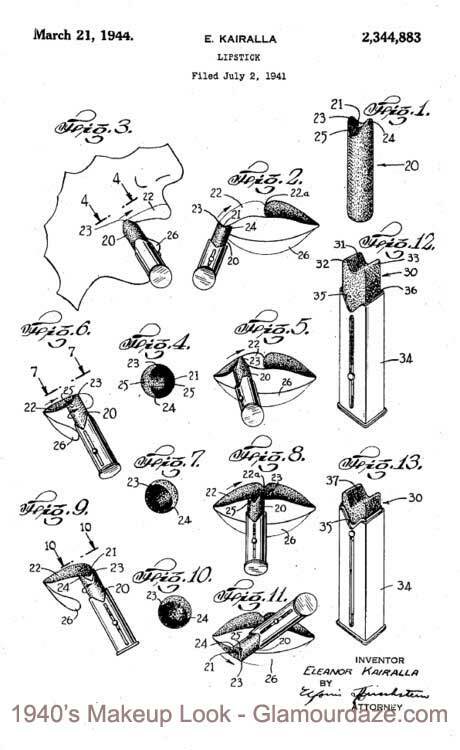 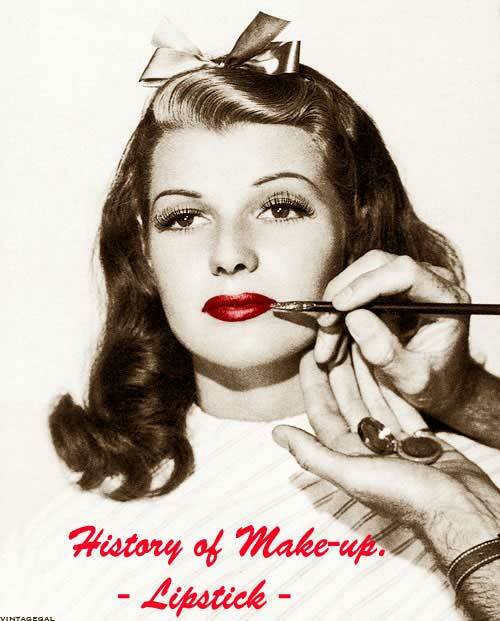 History of Makeup – 1900 to 1919. 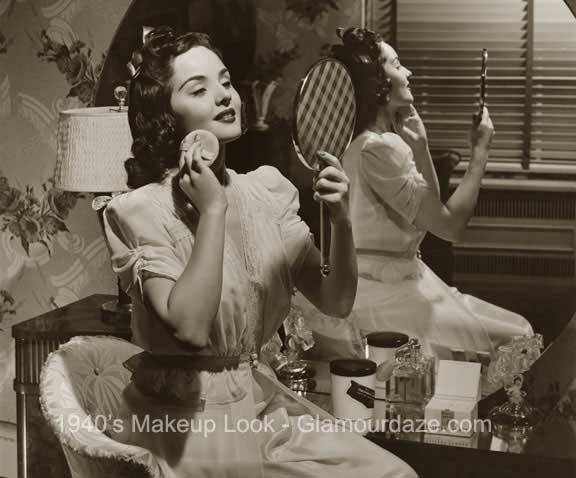 Classic Beauty – The History of Makeup. 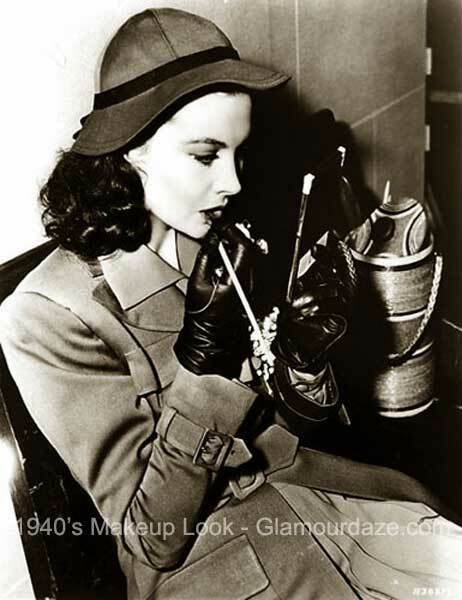 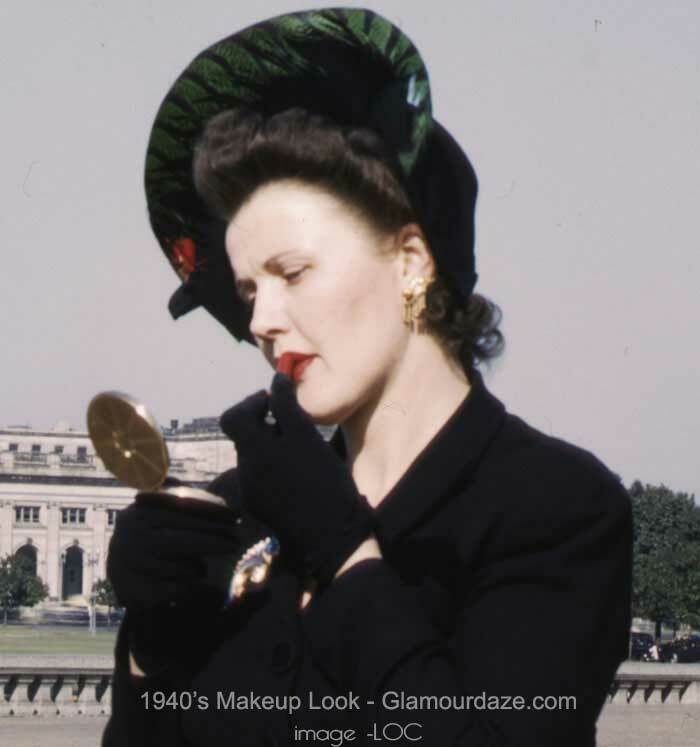 1940’s Fashion – Makeup Guide. 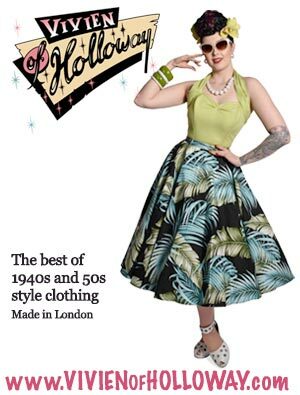 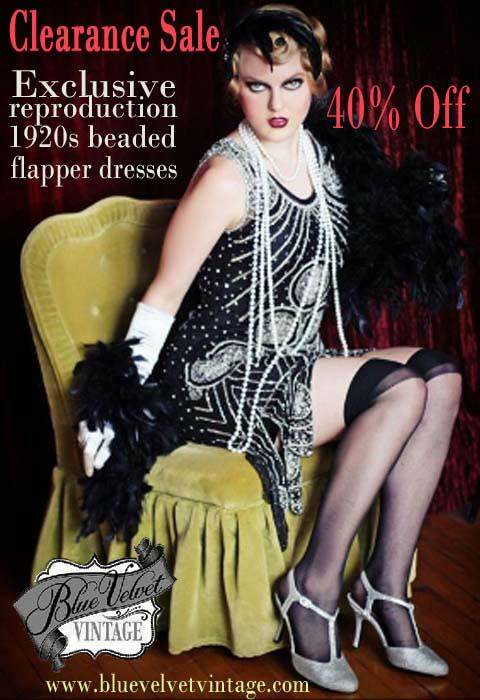 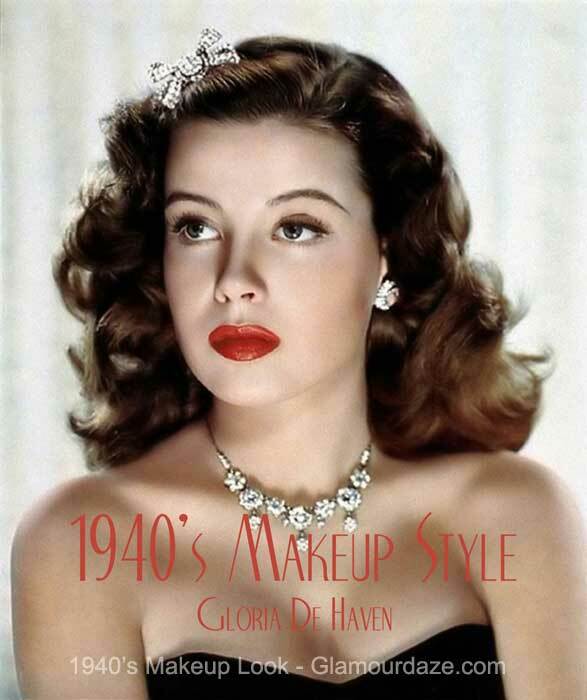 Want to be a 1940’s Bombshell Beauty? 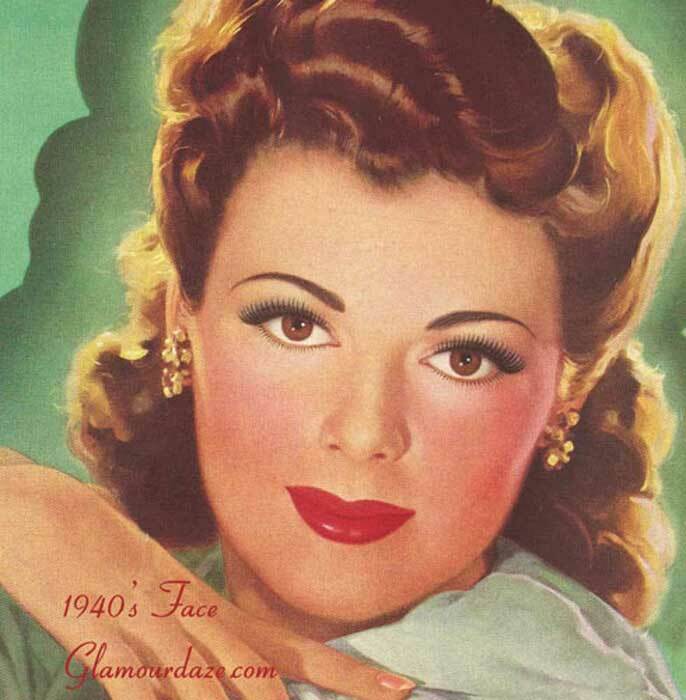 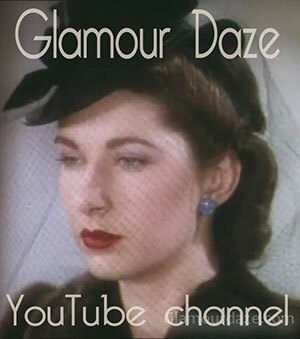 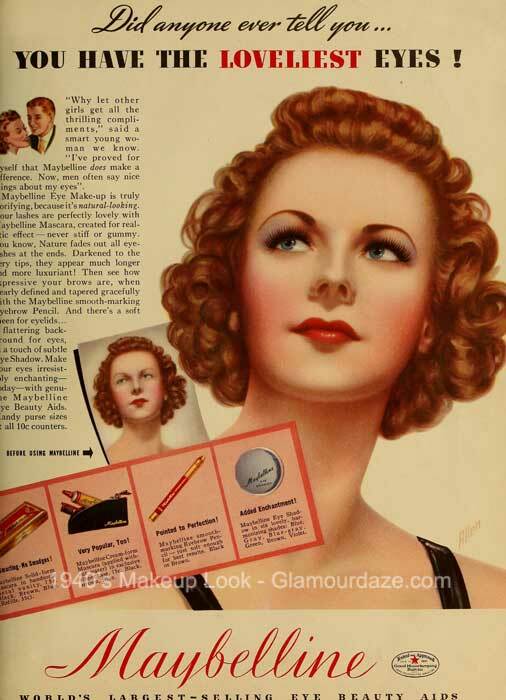 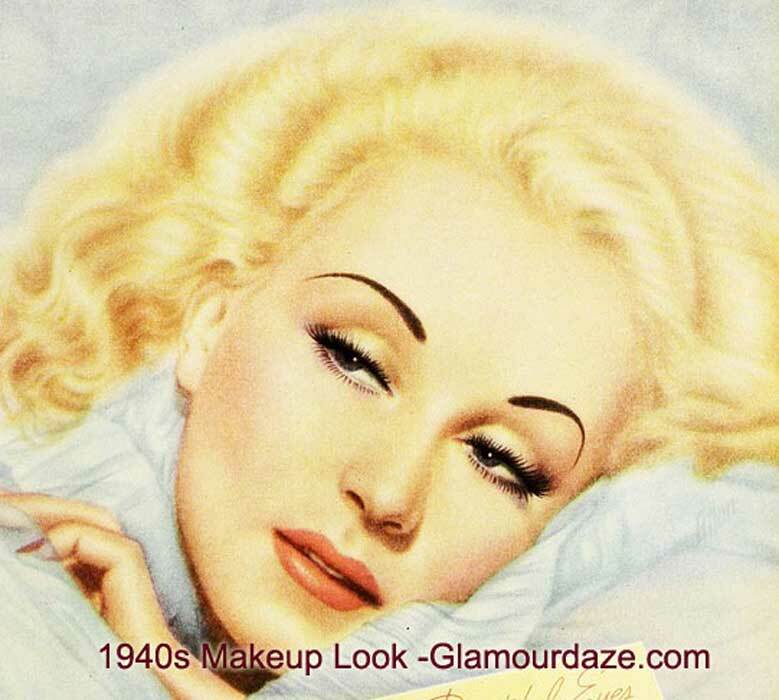 Vintage makeup Guides – the 1940’s Look. 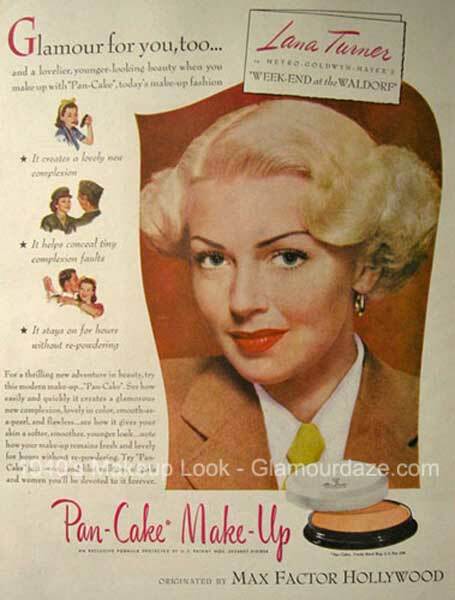 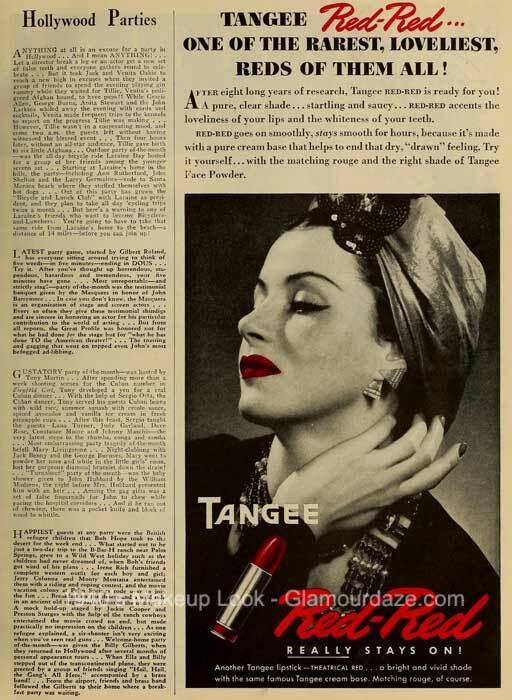 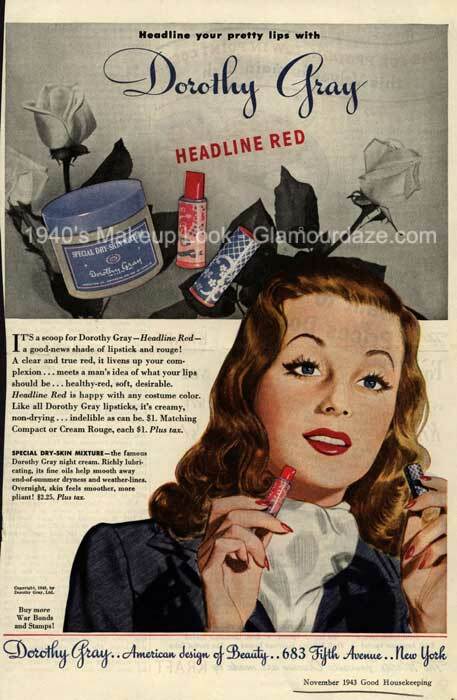 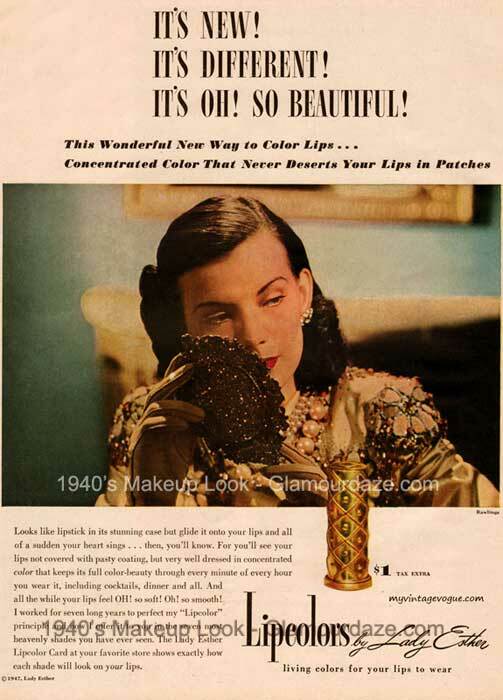 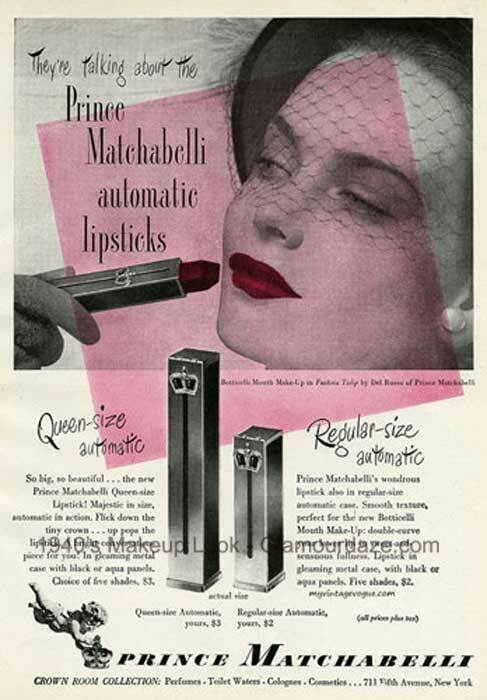 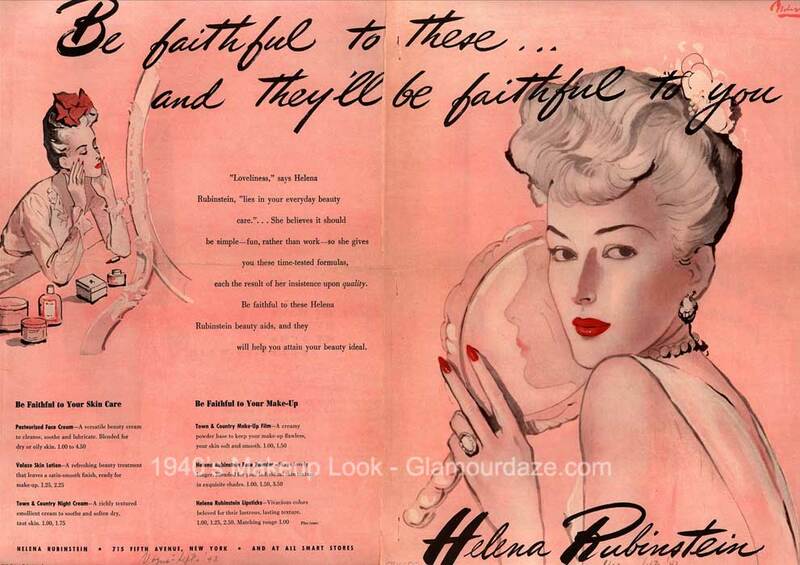 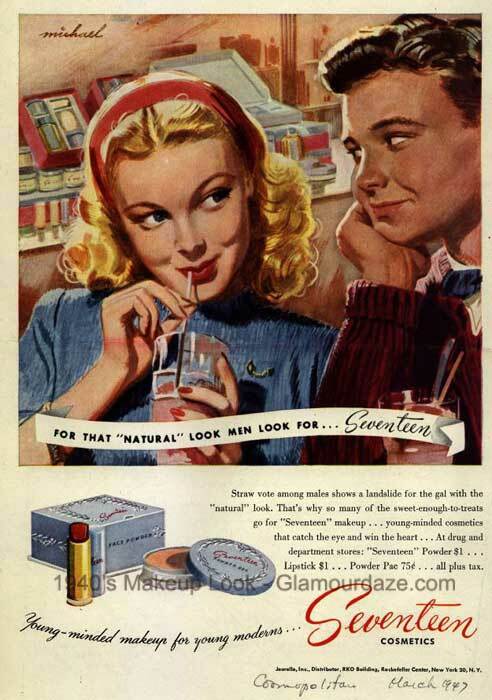 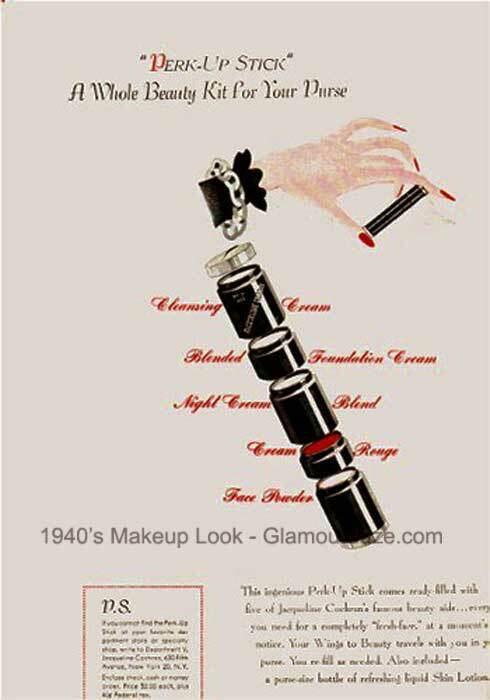 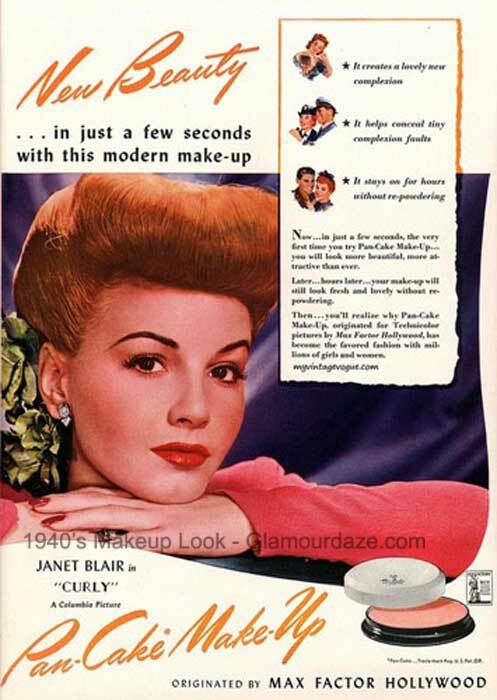 1940s Cosmetics – Ad Access. 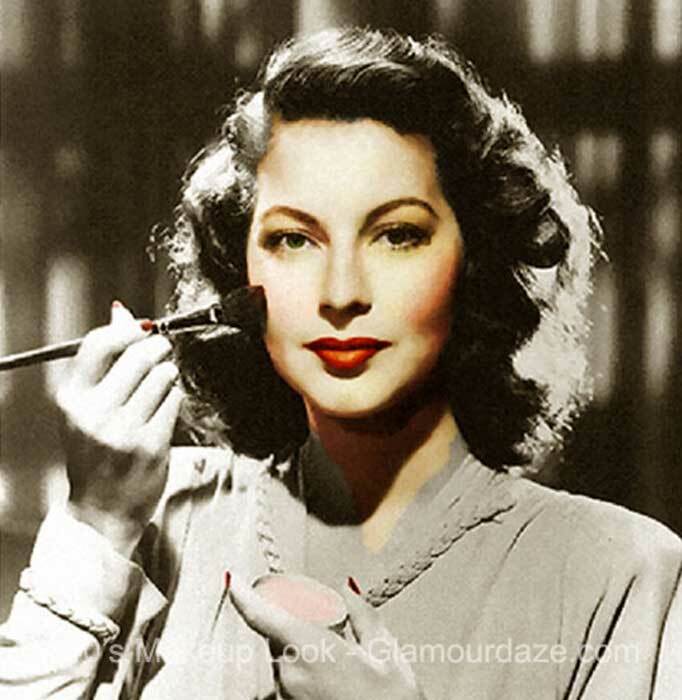 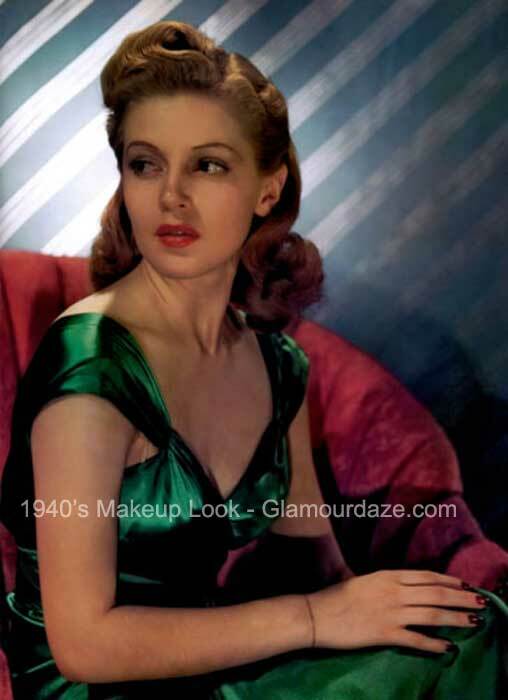 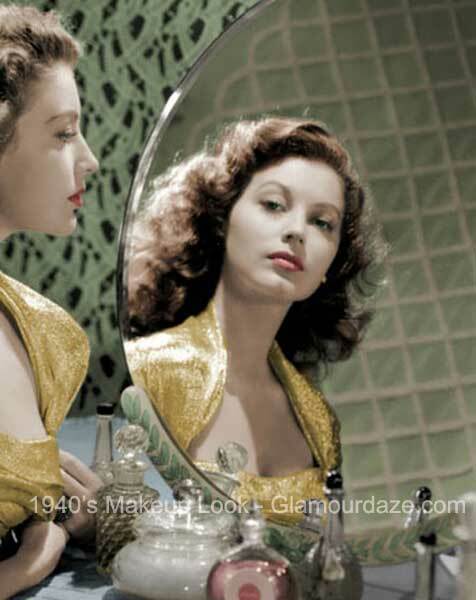 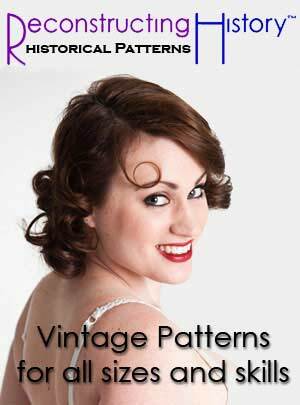 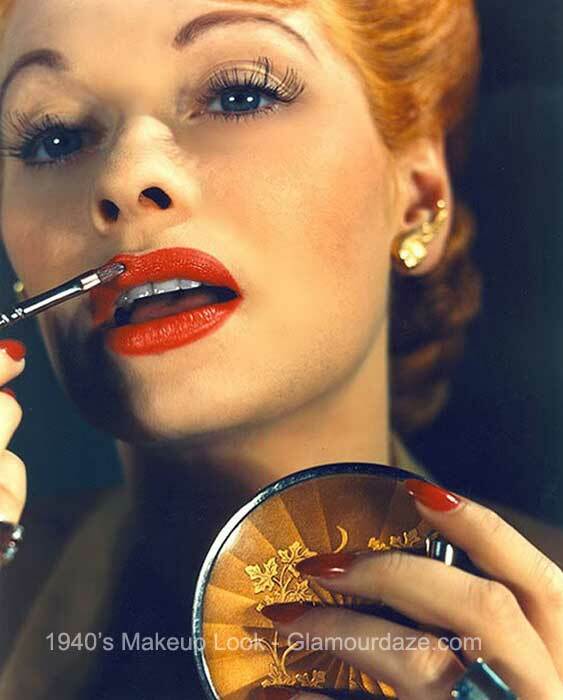 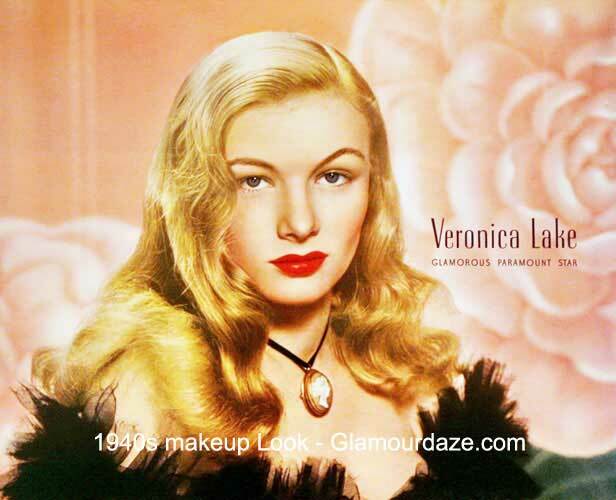 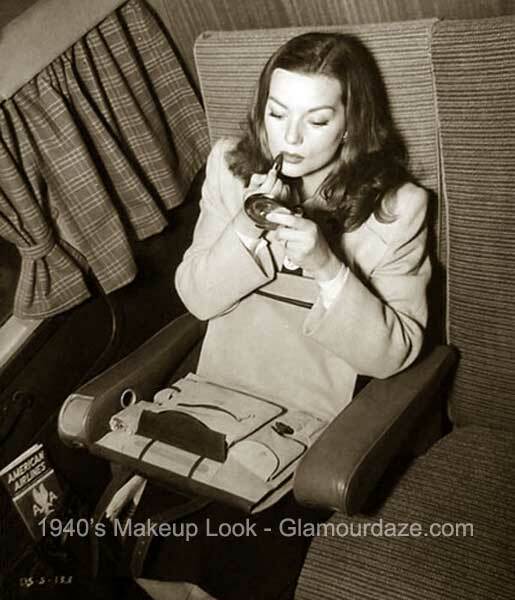 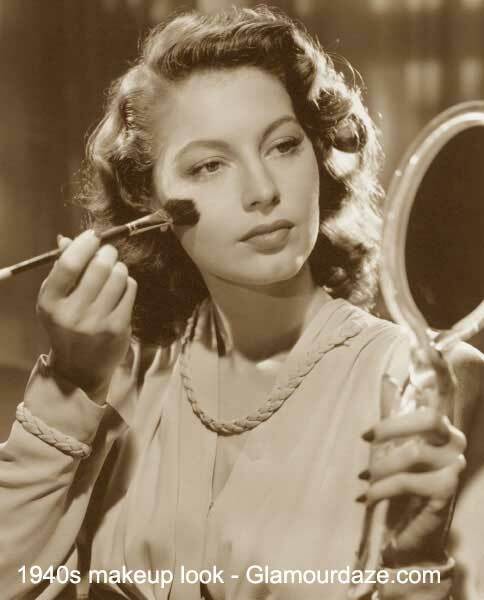 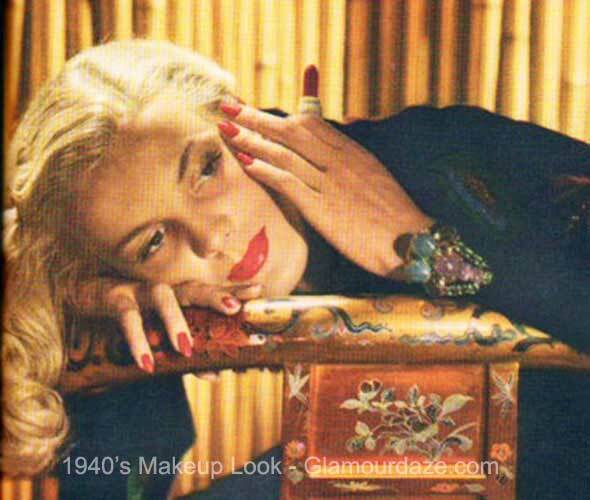 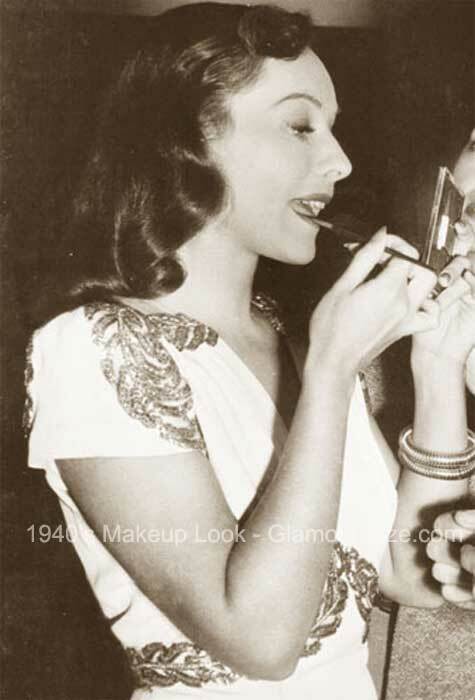 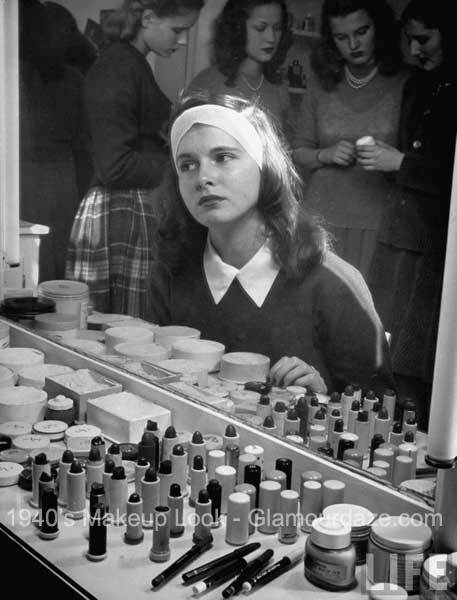 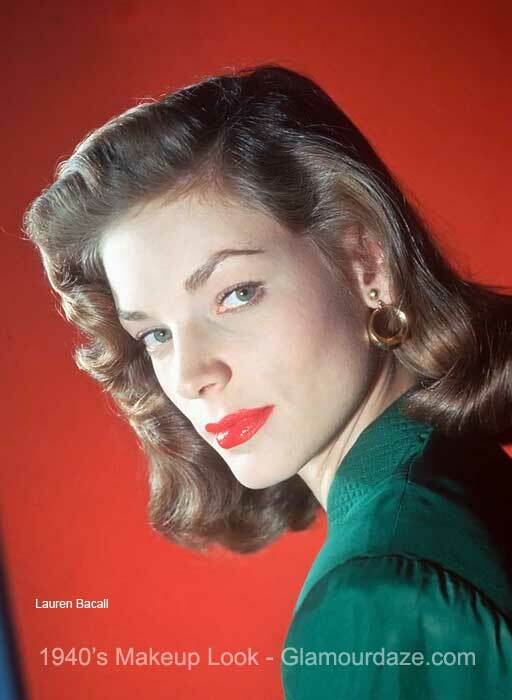 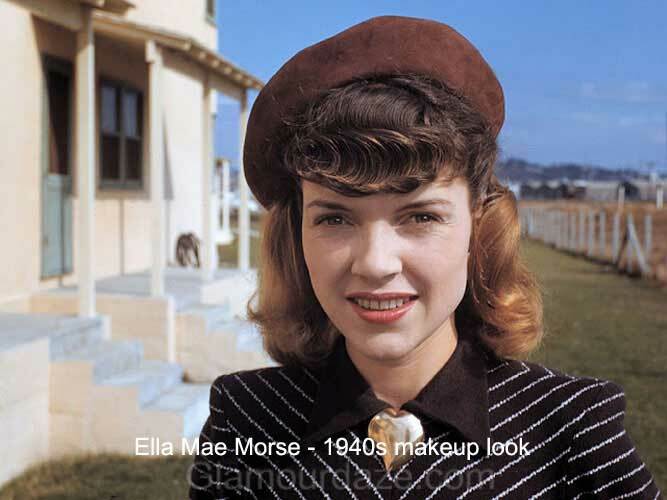 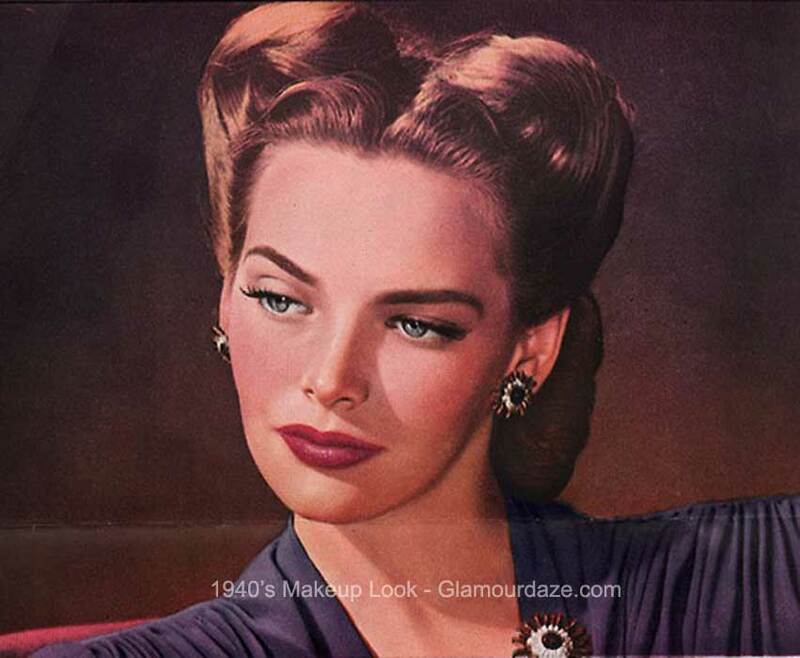 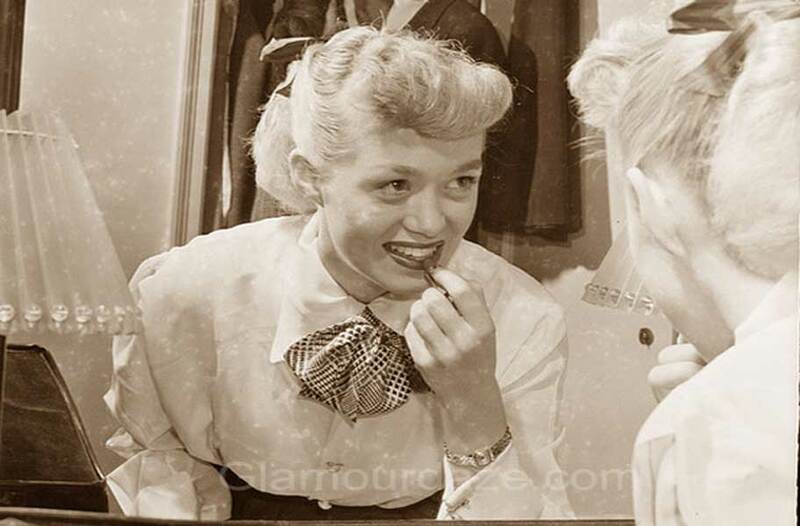 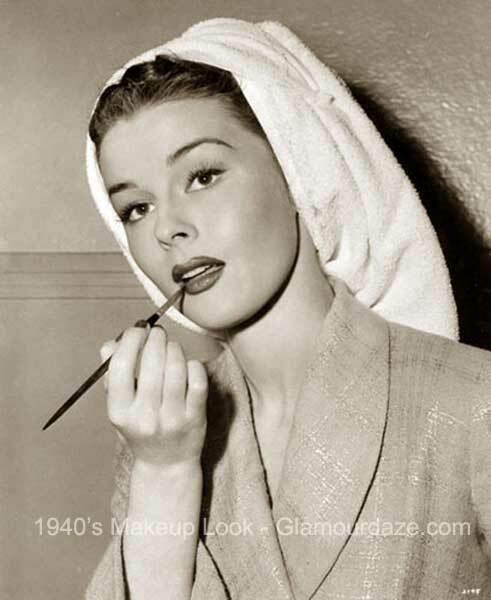 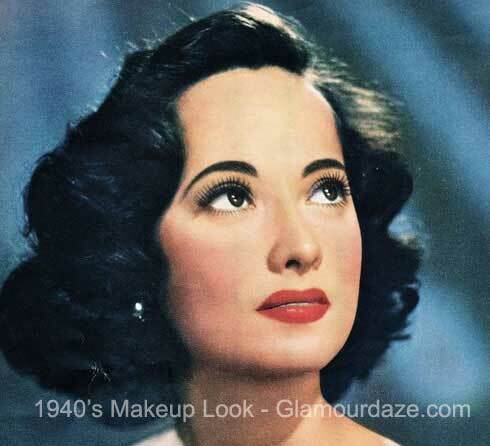 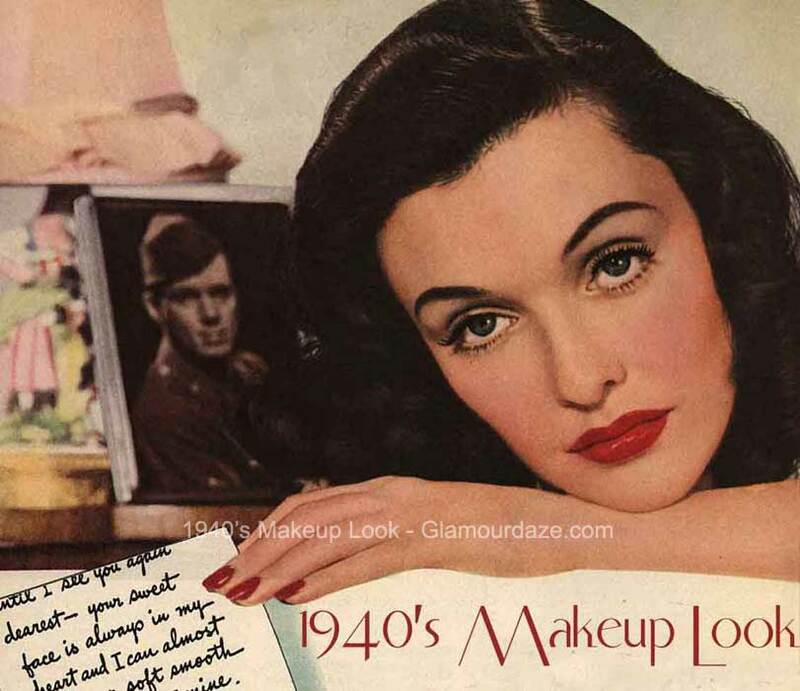 Return to Style – 1940’s Makeup.